Abstract. Observations and data for all six sites surveyed are compared in this final summation. Some findings from individual surveys already posted are repeated here; more findings from other research have been added in order to place our experience in a broader context and contrast our data with that of the long-term monitoring projects of UC Santa Cruz and the California Department of Fish and Wildlife. Our early consideration of issues such as zonation, alga growth, or species diversity in the California Intertidal zone has matured over the course of our surveys and led to an improved understanding of the value of long-term observation of the dynamic and highly diversified ecological environment of the intertidal zone as a component of a complex ocean system crucial to the health of our planet. Introduction. Our 2014 survey of the ecology of intertidal invertebrate and marine plant communities from south of Point Conception to north of Point Arena on the central California coast in now complete. The primary objective of the study as set forth in our Statement of Purpose was to record detail of environmental conditions and catalogue invertebrate species at selected survey sites. Secondarily, further evaluation was made of one species, the owl limpet Lottia gigantea, previously observed by the author in 2001 at Fitzgerald Marine Reserve in Moss Beach CA. Other studies would be considered as opportunity arose. Survey reports and field data sheets for each site may be viewed at the 2014 Intertidal Ecology Survey website. In this document, we consider data from all six sites together, discuss further several topics presented in the survey reports, and set forth conclusions based on our survey results. Survey Sites. 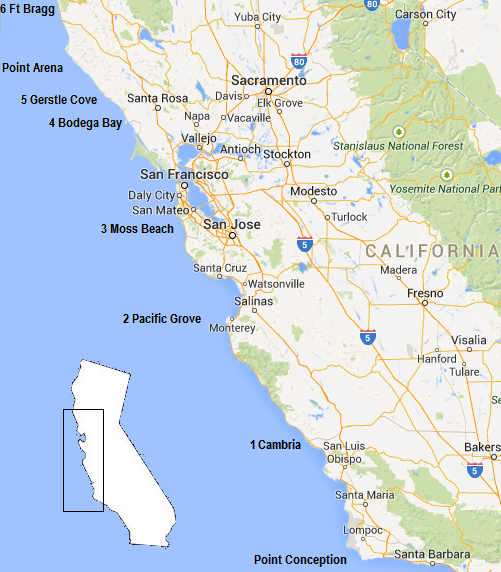 The following are the sites surveyed for our 2014 California Intertidal Ecology Survey. The site locations proceeded northward from Morro Bay CA to Fort Bragg CA, a distance of about 400 miles traversed between March and June 2014. All sites were within marine reserves and thus touch on issues of protection of the intertidal zone in areas where human activity is to one degree or another controlled. Basic substrate profiles for the sites began with online geological maps of the California Geological Survey. Transects were laid out and quadrats surveyed in four of the six sites; at other sites the surveys relied on personal observation and estimation. Environment Information. Environmental conditions were recorded at the start of each survey period. Air and water temperature were recorded for all sites, and at five sites salinity (and specific gravity) and pH were recorded. Temperature stratification was not recorded. Maximum tidal ranges for this year on this coast are: Methods. Mapping of sites was confirmed by reference to maps of the California Geological Survey, and of the National Oceanic and Atmospheric Administration (NOAA). At several sites large mats of marine algae covered substrates, and some specimens did not occur evenly distributed over a level substrate, so in all of the intertidal zones the less rigorous approach of visual observation and scaled estimation of species abundance was employed where counts of individuals were impractical (Murray, et. al., “Methods for Performing Monitoring….”). Non-destructive sampling. In our surveys we collected no samples and disturbed no animals or substrates other than to push long strands of algae to one side and to probe with fingertips in thick mats of algae covering rock shelves. Instead, we captured in digital images the animals and plants of the areas surveyed (digital images are in the Field Data Sheet for each site), in accord with the methods set forth by Littler and Littler (1985). Observing this approach required no animals be picked up and inspected to better identify them, no rocks be overturned to discover the life beneath them, and that no samples be preserved for later study. Consequently, there was difficulty even for professionals in identifying some animals, algae, plants, and geological characteristics from photographs no matter how high the resolution; more than a few specimens would have required examination under a microscope for proper identification. Transects and quadrats. Where transects were used to survey an area, a 100 meter flexible tape was laid over rocks and along shelves and the length to be surveyed and the orientation of the tape were recorded, and the transect was photographed. A quadrat measuring one square meter and divided into one hundred ten-centimeter sections was then moved along the transect at one meter intervals. Animals in each ten-centimeter section were identified and counted, and plants were identified and their percentage of cover within the quadrat estimated (algae occurring in twenty sections of the quadrat were estimated at twenty percent cover). Dense mats of algae were probed to discover and count any specimens within an algae mat. Counts and cover estimates were recorded in the field data sheet for each survey site, along with the number of transects and quadrats and their strike and dip, and most specimens were photographed. Field data sheet. For each of the four intertidal zones of a site, field data sheets recorded taxon name, common name, size, color and markings, count or coverage percent, and description for specimens occurring in groups. For individual specimens, we recorded taxon name, common name, size, color unique marks, activity (still, in motion, feeding…), relationships (solitary, commensal, parasitic) and condition (healthy, withered…). Coverage by percent was used for specimens such as sea grass that could not be counted individually, and “rare” was entered when coverage was less than one percent. Some estimates were made after the fact from photographs. Data for each zone were recorded separately. Survey reports. Upon completion of each survey, the findings recorded in field data sheets were extracted for presentation in a report format and posted together with the field data sheet to the 2014 California Intertidal Ecology Survey website. In each report for a survey site, charts of “Relative Zonal Occurrence” were prepared for Invertebrate Species, and Marine Algae and Plants, by tabling all the species in each zone and transferring count or coverage from the field data sheet. As examples, a value of 24 was entered for a count of 24 per square meter, and a value of 50 was entered for fifty percent coverage. Findings for Combined Survey Sites. 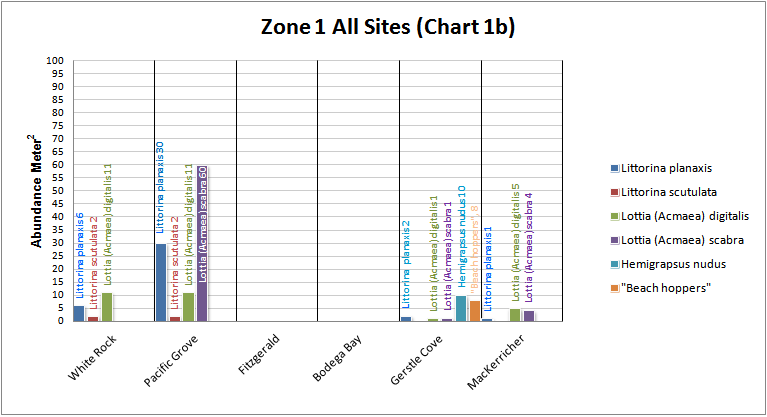 Abundance for all sites in each zone. At each of the six sites surveyed we reported populations for each of four intertidal zones. In the following, we combine the findings for all sites and report them for each of the intertidal zones. Zone 1 species for all sites. Acorn barnacles were found at all sites, although in very small numbers at White Rock, Fitzgerald, and MacKerricher. 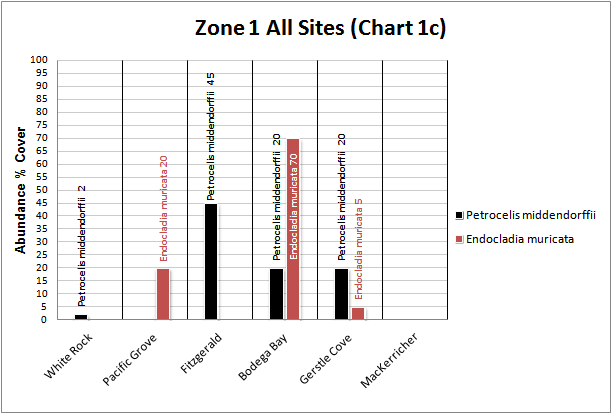 The latter two sites had comparatively less surface high enough to be exposed as Zone 1. We did not distinguish between the acorn barnacles Balanus glandula and Chthamalus dalli/fissus until the last two surveys at Gerstle Cove and MacKerricher (and later we revised counts for both genera of acorn barnacles at White Rock based on re-examination of photos). In our site at Gerstle Cove C. dalli/fissus numbered slightly less than B. glandula, but at MacKerricher we counted twice as many C. dalli/fissus as B. glandula. Looking again at our photographs of acorn barnacles in the first four sites, we are inclined to think they mostly are C. dalli/fissus because of their very small size, but decline to compound our error by so asserting. The MARINe Workshop SWAT Team PDF Guide to common California intertidal invertebrates & algae… shows the differences between the two species. Periwinkles were not plentiful at any of our sites. At Fitzgerald that may be due to the lack of very much Zone 1 rock surface; at another site [Bodega Bay] the dense algae cover may reduce space for periwinkles. Littorina planaxis/keenae were found more often than Littorina scutulata. Limpets were not found at two sites, Fitzgerald and Bodega Bay, and elsewhere Lottia digitalis were more common than L. scabra. Shore crabs (Hemigrapsus nudus) and unidentified “beach hoppers” were found by the hundreds at Gerstle Cove; occasionally one or two shore crabs were seen at other sites. Mussels (Mytilis californianus) were present only at Fitzgerald and Bodega Bay, and gooseneck barnacles (Pollicipes polymerus) were found only at Fitzgerald, together with mussels. Outside of the cove at Bodega Bay and MacKerricher there were large beds of mussels along the exposed shoreline. Our assignment of mussels to this zone has been challenged, as mussels are firmly established as indicator species for Zone 3. Our estimate was based on visual observation of what appeared to be the relative position of mussels and gooseneck barnacles in the Fitzgerald, and mussels in the Horseshoe Cove, intertidal zone. Observation of the tide cycle and height of the tide, together with closer examination of the mussel beds for other indicator species such as Cthamalus and Littorina, was not undertaken in our surveys at these sites and, as a result, we have not sufficient evidence to justify assignment of these animals to Zone 1. Assignment to Zone 2, however, is still not unreasonable, and will be considered further in the Discussion section following. The marine algae Petrocelis, tar spot algae, appeared in this highest zone at three sites, and Endocladia, turfweed (aka Brillo Pad, Nail Brush, Pot Scrubber, tufted red algae), was prominent this high at two sites, covering as much as 70 percent of rock surface. Zone 2 species for all sites. The predominant marine algae in this zone at four survey sites is turfweed (Endocladia muricata). Stunted Turkish towel (Mastocarpus papillatus) usually occurs within Endocladia beds in plentiful amounts, and tar spot algae (Petrocelis) encrusts large areas of rock surface at all sites. Smaller amounts of green pincushion (Cladophora columbiana) were found at Fitzgerald and Bodega Bay, and dwarf rockweed (Pelvetiopsis limitata) at Fitzgerald. Other marine algae occurring in small amounts in this zone were Ulva, sea lettuce (Pacific Grove, Bodega Bay, Gerstle Cove, and MacKerricher), Fucus, rockweed (Bodega Bay, Gerstle Cove, and MacKerricher), Corallina, coral weed (Bodega Bay), Pelvetiopsis limitata, dwarf rockweed (Fitzgerald), and Acrosiphonia (? ), green rope (Gerstle). Calcified encrusting coralline algae covers significant surface area at Bodega Bay and Gerstle. E. muricata (turfweed) briefly yields dominance to black pine rockweed (Neorhodomela larix) that blankets about half of the mid-tidal rock shelf surface of our site at Fitzgerald, and turfweed is overwhelmed in Gerstle Cove by two different unidentified strains of rockweed (see “Unidentified brown rockweeds” in the Discussion section below) that together occupied half of rock surfaces along with Petrocelis and Mastocarpus. At MacKerricher, algal cover is dense with tar spot algae, black pine rockweed, turfweed and Turkish towel. A few periwinkles (Littorina planaxis/keenae) were seen in this zone at Pacific Grove and Bodega Bay. Acorn barnacles were rare at this level except in Pacific Grove and Bodega Bay; at the latter site the common barnacle Balanus spp. is abundant at 240 per square meter, although quite a few tests are dark inside and show no terga or scuta (all barnacles shells were counted together without regard for this). Dogwhelks, Nucella ostrina, were present in small numbers at Bodega Bay, among groups of acorn barnacles which may be prey of the dogwhelks. Lottia digitalis, ribbed limpets, and Rough limpets, L. scabra, occurred in small numbers at most sites, however only one owl limpet, Lottia gigantea, was seen at any of the sites. 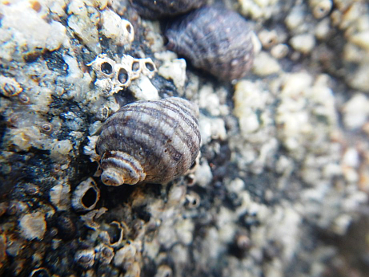 The black turban snail, Tegula funebralis, was the most numerous gastropod, being common in crevices below beds of Mastocarpus at White Rock, Bodega Bay and MacKerricher, and in Pacific Grove Tegula occurs with the small black limpet Collisella asmi attached commensally to its shell. At Fitzgerald, Tegula can be found in small numbers on bare rock and under Endocladia, but in Gerstle their numbers appear proportionally small if they are assumed to consume Mastocarpus. In this zone, shore crabs were rare. At White Rock, there were a great many hermit crabs, Pagurus samuelis, occupying black turban shells, and at Pacific Grove there was observed an instance of communal feeding activity by about fifteen Pagurus in turban snail shells (and one dog whelk shell) ranging in size from about 1 to 2.5cm, scrambling about together inside the upturned 5-inch wide carapace of what appeared to be a red rock crab, Cancer productus. Dense colonies of aggregating anemones, Anthopleura elegantissima, were abundant at most sites, in crevices and on vertical rock faces, and especially in the surge channels dividing the rock shelves at Fitzgerald. Only the survey site at MacKerricher evidenced few aggregating anemones. An occasional giant green anemone, Anthopleura xanthogrammica, was present at the base of rocks in the lowest parts of this zone. At Fitzgerald, beds of mussels and gooseneck barnacles ascend into the upper boundary of this zone, and at Bodega Bay very small, rare solitary mussels are found scattered among other molluscs attached to rocks. Conspicuous by their absence at many sites were mussels and shore crabs. Missing from all of our sites were ochre sea stars (Pisaster) and purple sea urchins (Strongylocentrotus purpuratus). Zone 3 species for all sites. The composite marine algae profile is similar here to the next higher zone but for less abundance. At White Rock, Petrocelis and Mastocarpus dominated, covering about fifty percent of the rocks. Mastocarpus mixed in with Endocladia muricata covered the horizontal top and upper section of the vertical face of rocks, while Petrocelis encrusted rocks down to the bottom of the zone, where the encrustation stopped abruptly along a single horizon. At Pacific Grove, E. muricata continued down into this zone in great abundance and, together with Mastocarpus and occasional Ulva, overlay most of the rock surface. The Endocladia, Mastocarpus, and Neorhodomela in Fitzgerald Zone 2 declined in Zone 3 and were replaced toward the west side of the survey site by a salad bowl of other algae, including sea lettuce (Ulva), coral weed (Corallina), and Mazzaella californica, rainbow leaf. The cover of turfweed at Bodega Bay fell only slightly in this zone, continuing to envelop much of the rock surface and only allow comparatively smaller amounts of Petrocelis, Mastocarpus, Cladophora, Fucus and Egregia menziesii, feather boa kelp. Rockweed still ruled this zone at Gerstle Cove, the same two unidentified rockweeds impeding with only slightly less quantity the spread of E. muricata, Mastocarpus, Petrocelis, Ulva, Corallina, encrusting red algae, Fucus, and surf grass (Phyllospadix). As the substrate changed in the MacKerricher survey area, Petrocelis spread out to settle among the abundant E. muricata, Mastocarpus, and Ulva. Near the transition to Zone 4 in most sites, there began to appear surf grass (Phyllospadix) and coral weed (Corallina), encrusting red algae and calcified encrusting coralline algae, and rockweed (Fucus). Acorn barnacles were rare this low except for a patch at Pacific Grove. Dogwhelks declined in number at Bodega Bay, along with Tegula, Lottia, and the tiny mussels reported in Zone 2. Gastropods became scarce at most sites with the exception of Tegula at White Rock and MacKerricher, where bunched into long crevices they were abundant below the lowest horizon of Mastocarpus and other algae, some turbans sporting on their shell the small black limpet Collisella asmi or slipper shells (Crepidula fornicata). The sudden rise in Tegula population at MacKerricher may be due to a change in substrate from vertical algae covered rock to a more flat, wide and open area with less dense algal cover. Hermit crabs, Pagurus samuelis, scrambled about on the sandy bottom of exposed tide pools at White Rock, and at Bodega Bay a hairy hermit crab (Pagurus hirsutiusculus) in a Nucella ostrina shell, with white-banded legs and a huge crushing claw, was observed and captured in a short video. Colonies of aggregating anemones, Anthopleura elegantissima, were abundant in crevices and on vertical rock faces in all of the sites except MacKerricher, and solitary giant green anemones, Anthopleura xanthogrammica, were common at the base of rocks. Bat stars, Asterina miniata, occasionally were seen crossing through this zone over algae. Again, ochre sea stars (Pisaster) and purple sea urchins (Strongylocentrotus purpuratus) were not observed. Zone 4 species for all sites. Marine algae in this zone was quite uniform across all sites, and always included surf grass (Phyllospadix), red algae (Corallina), and sea lettuce (Ulva lactuca) in varying amounts. Sea cabbage (Saccharina sessilis) was observed at Fitzgerald and Bodega Bay, feather boa kelp (Egregia) at Bodega Bay and MacKerricher, and small amounts of encrusting red algae at Gerstle Cove and MacKerricher. Gerstle Cove also had “splendid iridescent seaweed” (Mazzaella splendens) and golden rockweed (Silvetia compressa). Occasional patches of black pine rockweed (Neorhodomela larix) occurred together with more abundant algae in this zone at Fitzgerald. Beyond the survey area in Zone 4 at Gerstle Cove, abundant stiff-stiped kelp (Laminaria setchellii) broke the water’s surface along the low intertidal zone. Black turban snails (Tegula funebralis) were abundant in crevices below Mastocarpus at White Rock and occasionally at Pacific Grove. Colonies of aggregating anemones, Anthopleura elegantissima, were common in crevices and on vertical rock faces at White Rock, Pacific Grove, and Bodega Bay. Solitary giant green anemones, Anthopleura xanthogrammica, usually found at the base of rocks, were not seen in this zone at Fitzgerald or Bodega Bay, although it is not unlikely there were some in surge channels. Giant green anemones were uncommon at Gerstle Cove, however the few observed were as large as 10cm to 14cm in diameter (4 inches to 5½ inches). At Bodega Bay, wide beds of Anthopleura elegantissima flourished nearby, outside the survey area, mantling flat rock shelves several meters square in densities approaching 300 per square meter. That they persist in this unusual configuration may be because the area is protected and does not allow public access. Larger individual animals were sometimes encountered in this zone. A gumboot chiton (Cryptochiton stelleri) was observed at White Rock, and another at MacKerricher, and at Pacific Grove a large sea hare (Aplysia californica) was found in a shallow pool. Red abalone (Haliotis rufescens) were estimated to be common in vicinity of our survey site at MacKerricher, based on the anecdotal observations of local residents; several red abalone were taken by Pomo Indians from under rocks in the lower intertidal at Laguna Point cove while our survey was underway nearby. UCSC Biodiversity Surveys. We came late in our surveys to awareness of other marine life surveys underway along the California intertidal, some for many years. 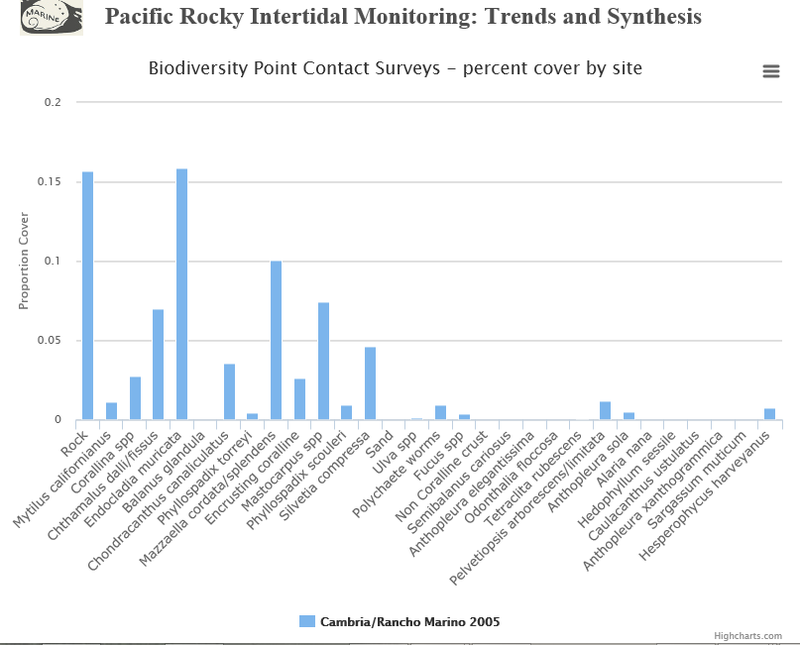 Prominent among these is the Pacific Rocky Intertidal Monitoring (PRIM) effort at the University of California at Santa Cruz, which maintains a detailed website and database of the monitoring more than 200 sites. The UCSC project is associated with the Multi-Agency Rocky Intertidal Network (MARINe), a consortium of research groups that follow MARINe protocols to collect data in compatible formats that can be kept in a centralized database. The activity of these groups is conducted under the guidelines of the 1999 California Marine Life Protection Act which funds reevaluation of existing marine protected areas (MPA) and design of new MPAs in a network to ensure the continued viability of marine life in the California intertidal. Regretfully, we were missing something when we started out selecting survey sites, adapting NOAA (National Oceanic and Atmospheric Administration) formats for data sheets, designing our survey method, and capturing data. We should have designed our approach following MARINe protocols, using similar methods and data formats, and selecting sites more closely adjacent to those already being monitored. In consequence, our survey at least would have data that is more meaningful in comparison to PRIM survey data instead of being different often by a magnitude, and the locations we surveyed would have expanded however slightly the scope of the PRIM sites. This is not to say that our data is entirely without use. And, in spite of data incompatibility, comparison with some of the PRIM results can be informative. There remain some interesting conclusions to be reached from even our cursive view of the intertidal. Note: our study utilized data collected by the Partnership for Interdisciplinary Studies of Coastal Oceans and the Multi-Agency Rocky Intertidal Network: a long-term ecological consortium funded by many groups, including BOEM (Bureau of Ocean Energy Management), PISCO (Partnership for Interdisciplinary Studies of Coastal Oceans), and NPS (National Parks Service). For more information, please visit pacificrockyintertidal.org. Our six survey sites correspond generally to the following PRIM survey sites. White Rock, Cambria CA. Point contact and quadrat survey data for the years 2001 and 2005 are available at the Cambria/Rancho Marino Biodiversity Survey findings website. Click to enlarge. 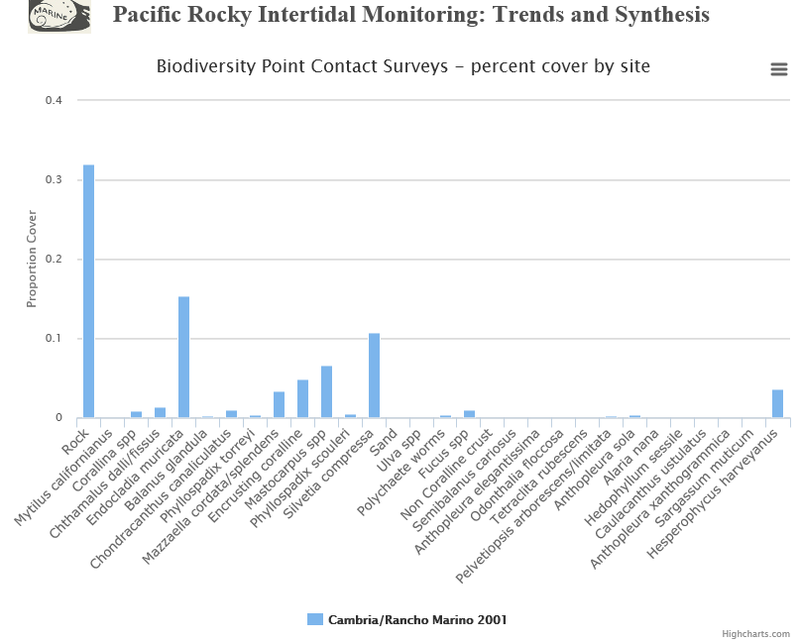 Graph courtesy of pacificrockyintertidal.org. A small table is provided here to ease reading the charts, which show two different scales for Proportion Cover. These point contact surveys show cover for Endocladia (16% in 2005) and Mastocarpus (8% in 2005) remained about the same between 2001 and 2005, but that rock surface lessened by half between 2001 and 2005, suggesting active algae growth. B. glandula dropped to zero. No anemones were recorded. Mussels increased slightly. The above quadrat survey from the PRIM site shows L plena/scutulata increased from about 35/ m2 to about 162/ m2, and L. scabra/conus increased from 20/ m2 to about 48/ m2. L. keenae decreased from about 64/ m2 to about 47/ m2, and T. funebralis decreased from about 90/ m2 to 76/ m2. At our survey site, about ¼ mile NW, we estimated Endocladia cover at 40% avg., and Mastocarpus cover at 28% avg., a much higher presence than at the PRIM site (16% Endocladia and 8% Mastocarpus). We found no B. glandula, however the PRIM point contact survey shows cover of C. dalli/fissus increasing from 2% to 6.5%; C. dalli/fissus may therefore have been present at our site but at the time we did not distinguish between the two species. In contrast to no anemones at the PRIM site, we counted 30/m2 aggregating anemones and 10/m2 giant green anemones. We found no L. scabra, L. scutum, Mazzaella, and no mussels, all of which were found at the PRIM site. Our Corallina averaged 5% cover, Phyllospadix averaged 6% cover, and P. samuelis were present at 6.5/m2. Our Tegula, while numerous at just under 50/m2, were not so populous as 76/m2 in 2005 at the PRIM site. The PRIM quadrat survey counted Pachygrapsus at 2/m2 and 3/m2 between 2001 and 2005; Pisaster was negligible (however the swath survey shown online indicates an increase in Pisaster from 1½ individuals to 7 individuals); Strongylocentrotus fell from about 6/m2 to 1/m2. PRIM point contact surveys record what is found directly underneath or in the near vicinity of 100 points on a transect. Quadrat surveys record the number of mobile invertebrate species within thirty-three 0.5m x 0.5m quadrats randomly placed along transects in high, mid, and low intertidal zones. Swath surveys record the number of sea stars in a two meter wide band centered over each transect. Our survey method moved a meter-square quadrat with ten centimeter sections along a transect at one meter intervals. Specimens in each section were identified and counted, and plants were identified and their percentage of cover within the quadrat estimated. Considering this divergence in method, comparisons of surveys are not very meaningful. Only the most general observations can be ventured. Monterey Bay NMS, Pacific Grove CA. Point contact and quadrat survey data for the year 2007 are available at the Point Piños Biodiversity Survey findings website. Of the species observed by both these surveys, there were no mussels at our site, three times the Endocladia cover (30%), four times the Mastocarpus cover (15%), six times more Tegula, and a great many more barnacles in the splash zone (70/m2). However, the PRIM Point Piños site had much larger populations of Lottia, up to 205/m2. Strongylocentrotus does not appear in this PRIM survey; the swath survey shows just over 7 Pisaster (mean number per transect). These counts may reflect the difference in habitat between the two locations. Over a short distance of one mile the habitat changes from protected, quiet shoreline (our site) to rocky shoreline exposed to the open ocean (the PRIM site). Fitzgerald MR, Moss Beach CA. 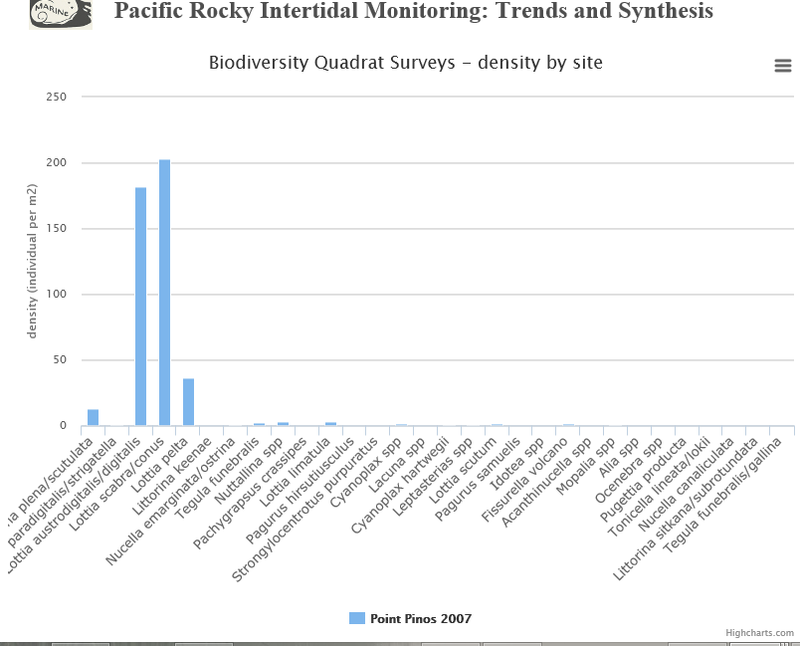 Point contact and quadrat survey data for the years 2002-2006 are available at the Fitzgerald Marine Reserve Biodiversity Survey findings website. In the Fitzgerald PRIM 2002-2006 surveys, Endocladia and Mastocarpus decreased approximately one-half percent while Neorhodomela larix increased from 4% cover to nearly 6% (shown in the online point contact chart); rock surface decreased by 5%. The count of C. dalli/fissus doubled, and B. glandula increased from zero to about 21/3% percent. Tegula increased from 75/m2 to 85/m2, P. samuelis increased to about 6/m2. A. eligantissima decreased by 1%, and A. xanthogrammica was not found in either year. Strongylocentrotus increased from under 1/m2 to 6/m2; the swath survey shows Pisaster increased to a mean number of 3 per transect. Our Fitzgerald survey sites included seven beds of mussels, Mytilus californianus, at 270/m2 and goose-neck barnacles, Pollicipes polymerus, at 120/m2; these species were not recorded in the 2002-2006 PRIM surveys at Fitzgerald. 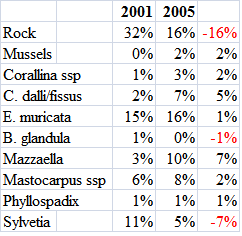 From 2006, Endocladia we saw had increased to 30% cover, Mastocarpus to 15%, Petrocelis to 10%, and Neorhodomela larix continued the trend apparent in 2002-2006 and had spread out to cover 50% of our rock shelf surface. 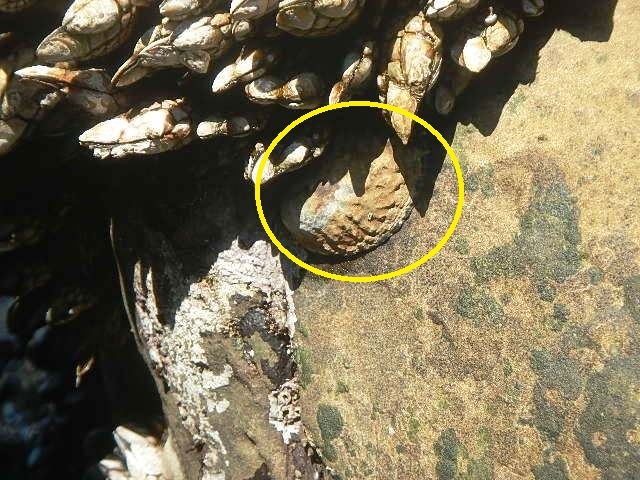 Small groups of acorn barnacles were found on brown outcroppings that rose into the high-tide zone, but Tegula occurred in densities of only 14/m2. We found A. eligantissima present on flat surfaces at avg. 10/m2 and on vertical surfaces at avg. 35/m2. A. xanthogrammica occurred at 3/m2 at the base of rocks in surge channels. Ochre sea stars, shore crabs, and sea urchins were not seen at all, and only one owl limpet was sighted. Horseshoe Cove, Bodega Bay CA. Point contact and quadrat survey data are not available at the Horseshoe Cove Biodiversity Survey findings website. Gerstle Cove, Salt Point SP. Point contact and quadrat survey data for the year 2010 are available at the Gerstle Cove Biodiversity Survey findings website. Our survey and the PRIM survey for Gerstle Cove are similar to the situation with the Monterey Bay NMS (Pacific Grove) survey comparison above. Our survey site was at the easternmost extent of the cove, off the rocky beach there, and the PRIM survey site was located at the south entrance to the cove, about 150 meters from the location of our survey. 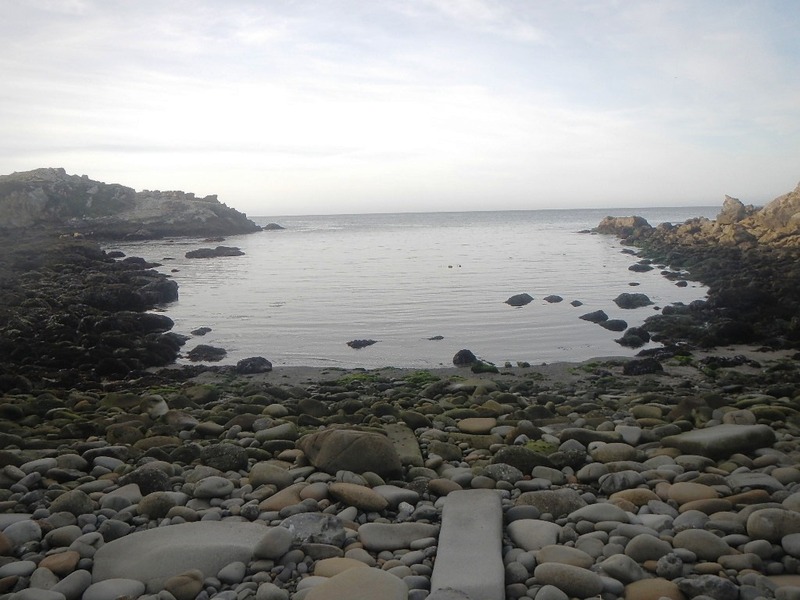 Over that short distance, habitat changed from protected, quiet shoreline to rocky shoreline exposed to the open ocean (photo courtesy of pacificrockyintertidal.org). Our survey found a large population of purple shore crabs (Hemigrapsus nudus) living at the rocky east end of the cove, averaging about 10/m2 in an area of 50 square meters. Over an area of about 250 square meters, the acorn barnacle Balanus glandula numbered about 32/m2, and Chthamalus dalli/fissus numbered about 24/m2, a ratio of roughly 3 Balanus for 2 Chthamalus (out on the point the PRIM survey estimated about 1% Balanus and 5% Chthamalus). Limpets were found only occasionally. Endocladia and Mastocarpus covered roughly 10% each, giving way to two unknown rockweeds that covered as much as 60% of the rock surface. Petrocelis encrusted about 25% of the rock surface. Anthopleura elegantissima on vertical rock faces averaged 30/m2; Anthopleura xanthogrammica were found occasionally. Specimens recorded for the PRIM survey were not abundant at our site. Laguna Point, MacKerricher SP. The nearest PRIM survey site was eight miles north and in consequence is not suitable for comparison. Results from Baseline Monitoring of Marine Protected Areas 2007–2012. In 2013 the first report of baseline monitoring of the Central California Coast under the guidelines of the 1999 California Marine Life Protection Act (MPA) was published (California Ocean Science Trust et al, 2013). 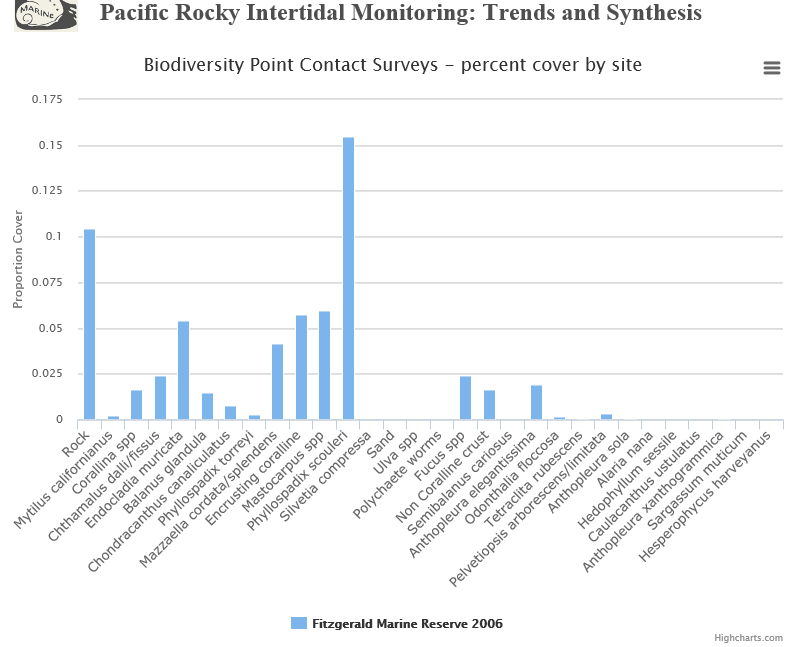 While the main objective of the MPA is to monitor the effectiveness of California marine reserves with regard to oceanographic conditions, seafloor habitats, intertidal, shallow, mid-depth and deep ecosystems, commercial fishing and related concerns, some of the information made available pertains to our surveys, especially that concerned with rocky intertidal ecosystems. The benchmarks first established for the rocky intertidal determined that “along the coastline, rocky intertidal ecosystems are characterized by six distinct community types. Four of these communities have high abundance of marine plants (e.g., surf grasses and algae) and relatively low cover of invertebrates (Communities 1–4). 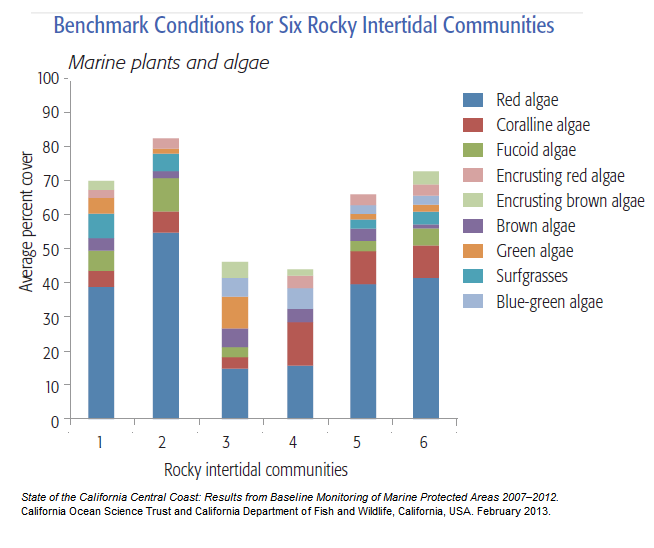 Two of these communities have nearly equal cover of both marine plants and invertebrates (Communities 5–6).” These communities are distinguished by their varying physical and biological characteristics and are geographically distributed along the coast (Community 2, for example, occurs at Point Sur, Pacific Grove, and above Santa Cruz). Some of the baseline characteristics of these communities were set out in the report. More specific baseline biological characteristics were given in these charts. From the map above, we can see which of our survey sites correspond with these communities (we have not yet located corresponding information for the California North Central Coast). Comparing the baseline communities with our survey sites yields some interesting results. White Rock, Cambria CA and Community 5. Community 5 is described as having low invertebrate cover, high marine plant cover, low wave swell, with barnacles as the dominant invertebrate. 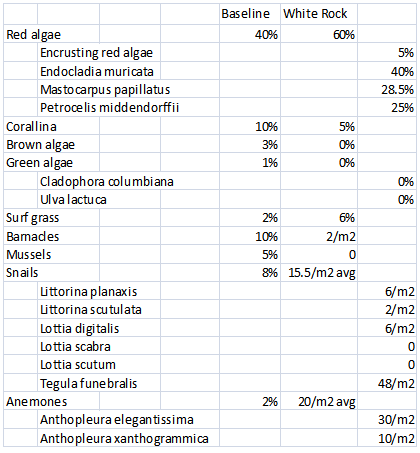 Following the chart for the communities, the average percent cover for marine plants and algae in Community 5 is roughly 40% for red algae, 10% for coralline algae, 3% for fucoid, brown and encrusting algae, 2% for surf grass, and 1% for green algae. 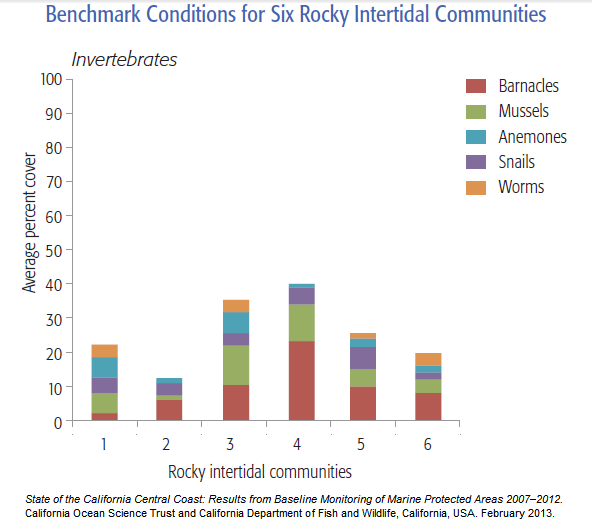 The average percent cover for invertebrates in Community 5 is roughly 10% for barnacles, 5% for mussels, 8% for snails, 2% for anemones, and 1% for worms. White Rock we found to have few invertebrates except abundant Tegula, high coverage by marine plants, and open exposure to the ocean. A comparison of our detailed data to the baseline summarized data cannot be exact; both sets of data estimate cover as a percentage, however our survey data counts invertebrates rather than estimates percent cover for them. Moreover, as the size of the area covered is not known for the baseline, we must assume it means “for any given area baseline cover will have this relative amount.” Once again, the results can only be suggestive. So, compared to Community 5, our White Rock survey is close to baseline for red algae (60% is an estimate of total surface covered), and somewhat so for other algae, but we found no mussels, few barnacles, and many more anemones. Coverage for “snails” is too highly summarized as a percentage for a useful comparison to count/square meter. Monterey Bay, Fitzgerald Marine Reserve and Community 2. Community 2 is described as having low invertebrate cover, high marine plant cover, low wave swell, with the dominant invertebrate again being barnacles. According to the charts, coverage by red algae is about 55%, with 5% Corraline algae, 10% Fucus, 5% surf grass, 3% encrusting red algae, and 1% brown algae. Invertebrates are shown with about 12% cover divided primarily between barnacles and snails, with very small numbers of anemones and mussels. 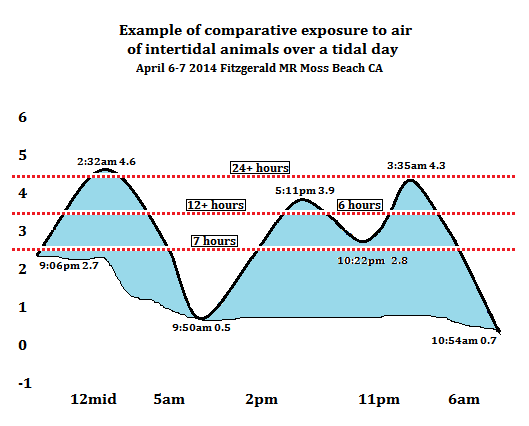 Pacific Grove and Fitzgerald both had low invertebrate cover, high marine plant cover, low wave swell (Fitzgerald because of the protection of offshore reefs). 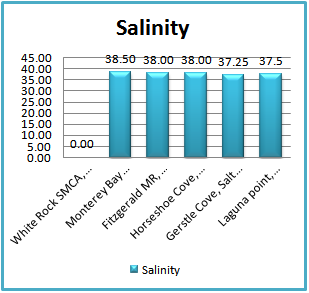 The same difficulty with mismatched data as in the preceding example prevents accurate comparison, and we must still assume the baseline data means “for any given area baseline cover will have this relative amount.” Looking at Pacific Grove, there is less red algae than in the baseline, and more Carollina, Ulva, and surf grass. The barnacle count (70/m2) and “snail” count (an average of 14/m2) were probably greater than baseline, and anemones were much more populous. At Fitzgerald, there was quite a bit more red algae than baseline (70% is an estimate of total surface covered), due possibly to the abundance of black pine rockweed (Neorhodomela larix). Other algae, and surf grass, exceed baseline except for Fucus, which was not found. Barnacles were below baseline (due to there being little rock surface in the high tide zone), however mussels were dramatically abundant and far exceeded the 1% for baseline. “Snails” were closer to baseline and, as with Pacific Grove, anemones were well above baseline. These results of initial monitoring of MPAs provide another context in which to consider the findings of our surveys and evaluate differences in our results, which may require we look more closely at how variations between locations in the same community can alter our notions of what to expect. For example, the dominance of barnacles will change with the amount of substrate available for settlement in the intertidal, such as at Fitzgerald MR where there is comparatively little suitable substrate for barnacles in the high tide zone, and cause variation from established baselines. Presentations and panel discussions of the first five years of monitoring and management of California’s Central Coast marine protected areas were videotaped at the State of the California Central Coast Symposium, held February 27 to March 1 2013, in Monterey CA. Several speakers reported on progress with Central Coast rocky intertidal baseline monitoring. Air and Water Temperature. Our survey proceeded at a gastropod’s pace four hundred miles (four degrees of latitude) up the California coast over a period of four months. It has been pointed out to us that, while we might have expected that the approach of summer would cause temperatures to rise, it is quite possible that the lower temperatures of higher latitudes may have caused our temperature readings to be reported as nearly equal at several sites. Ocean Acidity. Seawater pH is typically limited to a range between 7.5 and 8.4. The oceans normally are alkaline, which is above 7 on the measure of pH (below 7 is acidic). Pure water is neither acidic nor alkaline; it has a pH of 7.0. But because seawater contains many dissolved substances, it is actually slightly alkaline (basic), with a pH near 8.2. Since the beginning of the Industrial Age, however, ocean pH has fallen by about 0.1 (Center for Ocean Solutions, Ocean Acidification, 2014), and as increased CO2 is absorbed by the ocean, pH falls still more. Currently, the ocean has about 387ppm of carbon dioxide and a pH of about 8.1 (PISCO, 2014). Higher acidity removes dissolved carbonate from ocean water and reduces the amount of calcium carbonate available for building the shells and skeletons of sea creatures like calcareous plankton, coral, echinoderms and mollusks. Therefore pH is one of the environmental measurements essential to intertidal monitoring. The pH we recorded during our surveys, shown in the chart, had a disturbing downward trend as we moved northward along the California coast. However, values of 7.9, 7.8 and 7.6 seem much too low to be probable and may be inaccurate because of our method of taking readings (using a simple pH kit, which requires matching the color of a reagent in water to a color chart). Still, the consistent decline in values remains of interest. Substrates. Substrate as a factor in settlement in the intertidal zone is discussed briefly by Carefoot (1977) and mentioned in PRIM studies and in the baseline monitoring of the Central California Coast (California Ocean Science Trust et al, 2013). All studies readily acknowledge that substrate is only one of many factors impacting marine settlement, in addition to weather, seasons, wave shock, temperature, salinity, pH, tides, competition, predation, and so on. Broadly described, substrates include rock, sand, mud, pilings, and artificial structures (jetties and breakwaters). On rocky coasts substrates can be further defined according to kind of rock (basalt, shale, sandstone, granite), hardness, granularity (fine, course), texture (flat, smooth, cracked, pitted), composition (silicates, oxides, carbonates, sulphides, sulphates), geologic origin, and other characteristics. We have matched a selection of species from our survey to the type of rocky substrate in which they occurred. 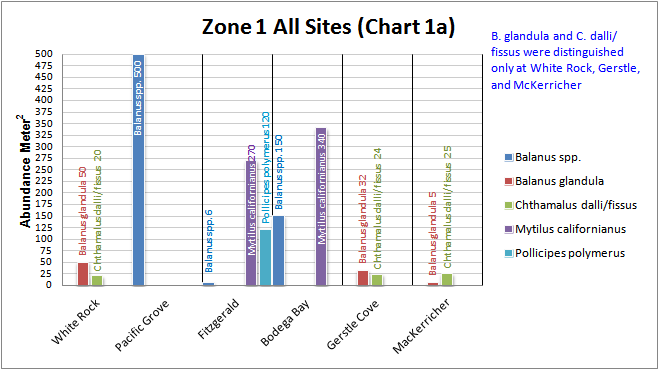 The chart shows four “substrate zones” ranging from granite to sandstone and the abundance, count or percent cover, of species found in each zone; abundance has been combined for sites occurring in the same substrate zone. Species found in all four zones are listed first. The identification of substrate for each site is based largely upon online California Geological Survey maps, which did not have sufficient resolution to identify substrate to within a few hundred square meters at any specific location. However, the geology and substrate identified for our survey sites from Fitzgerald Marine Reserve south correspond generally with the “geologic categories” set forth for the central coast in baseline monitoring of the Central California Coast (California Ocean Science Trust et al, 2013). Studies of substrate preferences of algae and animals in the intertidal zone seem infrequent, perhaps due to the difficulty of disentangling the numerous environmental factors influencing settlement of an abundance of different intertidal species. What studies there are suggest that, rather than simply the type of rock, some characteristics of different types of rock substrate may be involved in settlement either directly, where surface texture facilitates sessile attachment, or indirectly, where the chemical composition of a substrate may influence the growth of biofilm that invites settlement. Wahl (2009), for example, cites Raimondi’s 1988 widely-referenced study suggesting that the barnacle Chthamalus anisopoma may experience less thermal stress settled on light-colored heat-reflecting granite at the higher end of its vertical distribution than on dark-colored heat-absorbing basalt. 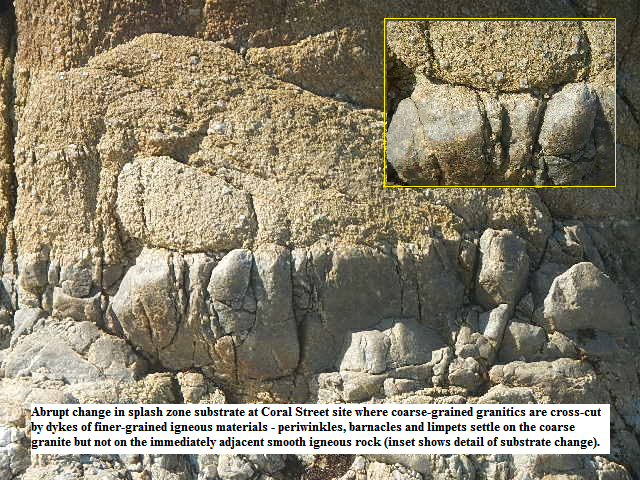 A example of variable settlement based perhaps on rock type occurs at our Coral Street site in Pacific Grove in Monterey Bay where there occurs in the rock of the splash zone an abrupt change in coarse-grained granite that is cross-cut by dykes of finer-grained igneous materials. Periwinkles, barnacles and limpets settle on the face of the coarse granite but not on the immediately adjacent face of the smoother igneous rock; they do settle in the cracks and fissures in the igneous rock. Our examination of substrate was inadequate. In addition to the poor resolution of geologic maps consulted, we had not the tools a geologist would have used to make a careful analysis of substrate, other than a solution of hydrochloric acid to detect limestone. Neither did we have sufficient practice in field geology to properly identify substrates. Without giving it much thought, we expected to rely on photographs which, it has since become clear, are rarely adequate for identification by even professional geologists. After all that, we are left with our rather broad estimates of abundance. In spite of the unsatisfactory data underlying this exhibit, we believe that in properly designed surveys of intertidal communities, data for working up exhibits of species by substrate would add substantially to the profile of any intertidal community. Zonation. 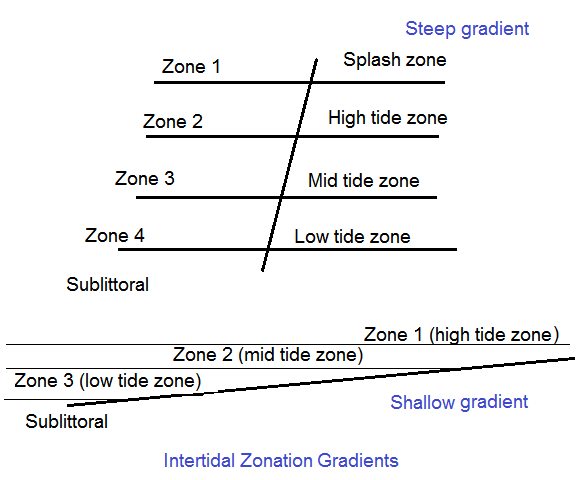 Ideas of intertidal zonation vary somewhat, offering models with four horizons, and others with three; our surveys were undertaken using Ricketts’ (1985) assignment of four “zones” to the intertidal habitat. At Pacific Grove, and again at Fitzgerald Marine Reserve, the actualities of the locations caused us to look more closely at the concept of intertidal zonation. At Pacific Grove, so many species occurred in close proximity that there seemed little distinction between a Zone 2 and a Zone 3, neither from the standpoint of spacial differences, nor that of species distinctions. At Fitzgerald, the shallow gradient of rock shelves made “zones” almost indistinguishable along Moss Reef. In consequence we found it difficult to apply one model of zonation across all our survey sites. As early as 1949, T. A. and Anne Stevenson proposed three zones for the intertidal: the supralittoral zone, the midlittoral zone, and the sublittoral zone. Fringe areas above and below the midlittoral zone, the supralittoral fringe and the sublittoral fringe, covered infrequent exceptions (we have not heard of any suggestions that this might be five zones). Another arrangement commonly followed is spray zone, high tide zone, middle tide zone, and low tide zone. Other schemes have been proposed and take into account many more factors than pertain to the zonation at our survey sites; a brief summary can be read at Netarts Bay Today. 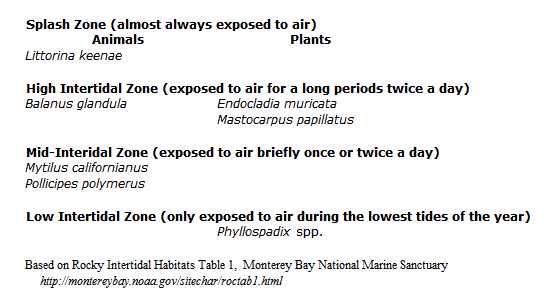 The zones can be demarcated by physical properties, tidal range, or biota distribution (a cursory list of biological zonation is at a Rocky Intertidal Habitats website of the Monterey Bay National Marine Sanctuary); our surveys report both the tidal range and the biota distribution at our sites. In our surveys, we found that intertidal zonation varied also with the gradient of the intertidal. A simple illustration of this variation of gradient was evident most clearly on the 1 to 1.5 meter high vertical rock faces of surge channels at Fitzgerald Marine Reserve that occasionally cut through the rock shelves of the FMR. 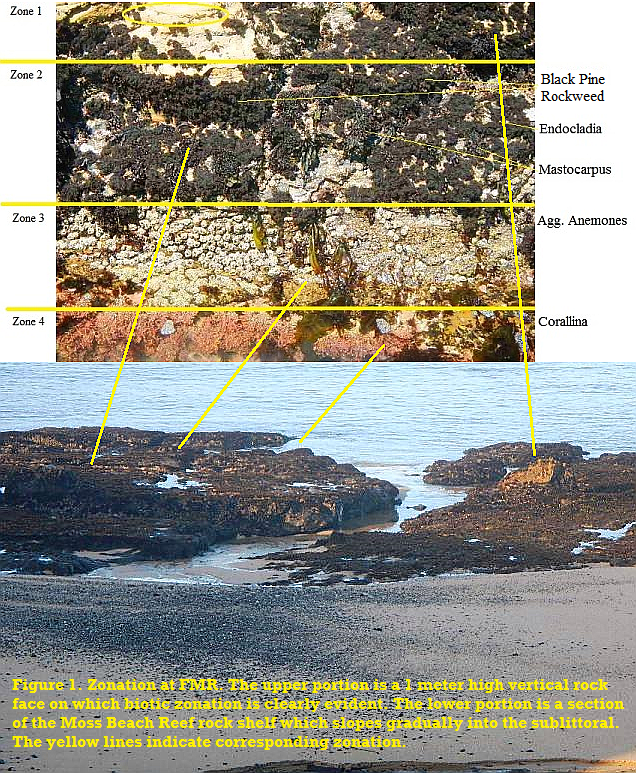 The rock face shown in the top portion of Figure 1 indicates biotic zonation of one vertical rock face of the Moss Beach Reef shelf, delineating four zones and the biota that determined each (Zone 1 was distinguished by common barnacles). Zonation on the surface of the flat rock shelves was less obvious, following the gradual slope of the rock shelves over perhaps 20 meters out into the sublittoral. Figure 1 suggests the approximate biotic zonation for the flat rock surface as it corresponded with the same zonation on the vertical rock face. We found that at locations with a steep gradient four zones could easily be distinguished, and that where a gradient was more shallow, only three zones were evident. This of course is intuitively obvious to the professional. Carefoot (1977) notes “generally where the range of the tides is small, or where the slope of the beach is steep, the bands [intertidal zones] are narrow; where the range of the tides is great, or where the slope of the beach is flat, the zones are wide.” There’s no particular virtue at having at arrived at the same obvious conclusion, however as zonation varies so much between locations, perhaps the use of more than one model might be appropriate according to circumstance. We hasten to emphasize that “gradient” is only one factor in determining zonation, even if among the first prominent to a casual observer; numerous other factors are set forth in Carefoot’s much more complex discussion of “The Causes of Intertidal Zonation” in Pacific Seashores. Such values as these were derived by the simple expedient of dividing the annual maximum tidal range shown in tide tables for a location by four and calculating the range of each zone (+6.70 to -1.60 = 8.30 / 4 = 2.075; for example, 6.70 – 2.07 = 4.63, yields a range of +6.70 to +4.63). We then assigned animals and plants to one or another of such zones based on our best estimation of tide levels. This erroneous bias has skewed our perception of zonation assignment and underlies some of our misconceptions as discussed elsewhere in thus summary report, especially with regard to indicator species. Microhabitats. At Mackerricher State Park we observed that the landscape changed as we moved laterally through the same intertidal zone. In the first location, the substrate was composed of large rocks and rock benches that rose up through Zone 3 into Zone 2 and displayed species zonation on vertical rock faces, mostly algae without many invertebrates. Nearby in a second location, the substrate in the same intertidal zones was broad and flat and surfaced with smaller rubble on which algae such as Mastocarpus had settled; this substrate hosted a large population of Tegula. These two locations may represent separate microhabitats in the same single intertidal zone, influenced by a vertical emersion gradient in the first location with wave action, temperature and oxygenation varying from that of the horizontal emersion gradient of the second location (UK Marine SACs, 2001). The concept of microhabitat might also be used to examine variations between our survey results and the baseline community profiles discussed above in baseline monitoring of the Central California Coast (California Ocean Science Trust et al, 2013). Perhaps our Monterey Bay site at Coral Street in Pacific Grove differs only enough from the Community 2 profile that it could qualify as a microhabitat. Indicator Species. Indicator species serve, among other things, to determine ecological regions and in particular intertidal zonation. Various schemes identify one species or another as typical of an intertidal zone; over time the schemes have varied in terminology and criteria. Ricketts cited several. The differing ranges for indicator species “depends on not only the complex variables of tide, climate, and the life subject to these variables,” but also on the distribution of individual species; some “are wide; others are narrow.” Some share precise upper and lower limits, others may overlap, and the distribution of some may cross several zones. Also, the scale in feet shown in the chart should not be regarded as fixed because tidal range varies so much at specific locations (Ricketts and Calvin, p. 432). An example of a current assignment of indicator species can be found at the Monterey Bay National Marine Sanctuary website; the list shown here is taken from Rocky Intertidal Habitats Table 1. The animals, algae and plants cast in the role of indicator species in these various schemes seems consistent: periwinkles, barnacles, turfweed and Turkish towel, mussels, goose barnacles, and surf grass. However, their placement into one or another zone is not always consistent. Periwinkles and surf grass are always placed at the top and bottom of the intertidal zone, but distribution of others varies with the scheme which, in turn, is based on the different variables Ricketts mentions. Mytilus, for example, usually is listed as a mid tide Zone 3 indicator, however Riggs and Miller placed Mytilus in the high intertidal, Zone 2. Light (2007) states that “in areas of consistent wave action, the mussels can inhabit high intertidal zones successfully because of the wave splash, but in areas of periodic calm, their upper limit is in the middle intertidal zone” (Light, p. 12). In his discussion of the animals of the open coast rocky shores, Ricketts modified his zone assignment of several animals in order to accommodate their wandering ways; that is, their distribution through several zones. These Ricketts classed as “interzonal animals,” and included the seastar P. ochraceus, the mussel M. californianus, and the goose barnacle P. polymerus in a Mytilus-Pollicipes-Pisaster association “fairly well-restricted to the upper two-thirds of the intertidal zone…horizontal markers in marine ecology if ever there were any…” (Ricketts and Calvin, p. 214-24). Mussels and goose barnacles are also assigned to Zones 2 and 3 by Ricketts (5th ed., p. 227). 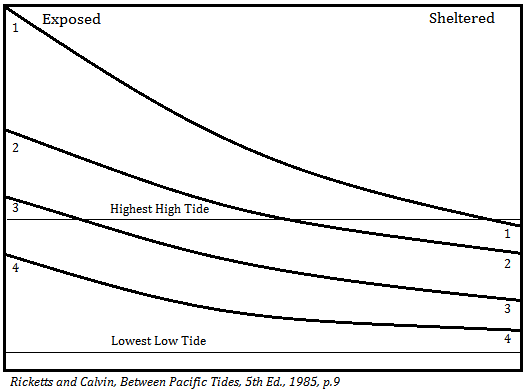 In the 3rd edition of Between Pacific Tides there is a diagram of “various animals in a mussel bed at Pacific Grove” that shows the normal distribution of Mytilus as zero to 3½ feet, but an extended distribution of up to 5 feet above the mean tide level (zero feet; Ricketts and Calvin, 3rd ed., p. 394, not included in the 5th edition). Photographic evidence for the occurrence of Mytilus above its indicator species placement in Zone 3 as assigned by Ricketts appears at several locations, even in Between Pacific Tides where, on p. 494, a photo of a rock (Fig. 364, contributed by James T. Carlton for the 5th edition) shows a small mussel bed very high above the waterline. Photos taken along the open coast at Santa Barbara and Carpenteria CA clearly show mussel beds in the high tide zone above the Zone 3 indicator A. elegantissima. Ricketts defined Zone 3, the middle intertidal, as extending from 0 feet to 2½ feet on the California coast, “from about mean high low water to mean lower low water – the zero of the tide tables” (Ricketts and Calvin, 5th ed., p. 7). On the day at FMR illustrated in this chart, animals at 2½ feet were covered and uncovered twice; at 4½ feet they also were covered twice but for far less time. Animals at 4½ feet were exposed to air for over 16 hours, and even those at 2½ feet were exposed for 7 hours. The longer exposure to air of animals at 4½ feet seems to suggest they were located above Zone 3, as does their position well above the Zone 3 indicator aggregating anemones, A. elegantissima, in bands low in the surge channels. Ricketts also pointed out that intertidal zones are not always determined by tide levels. 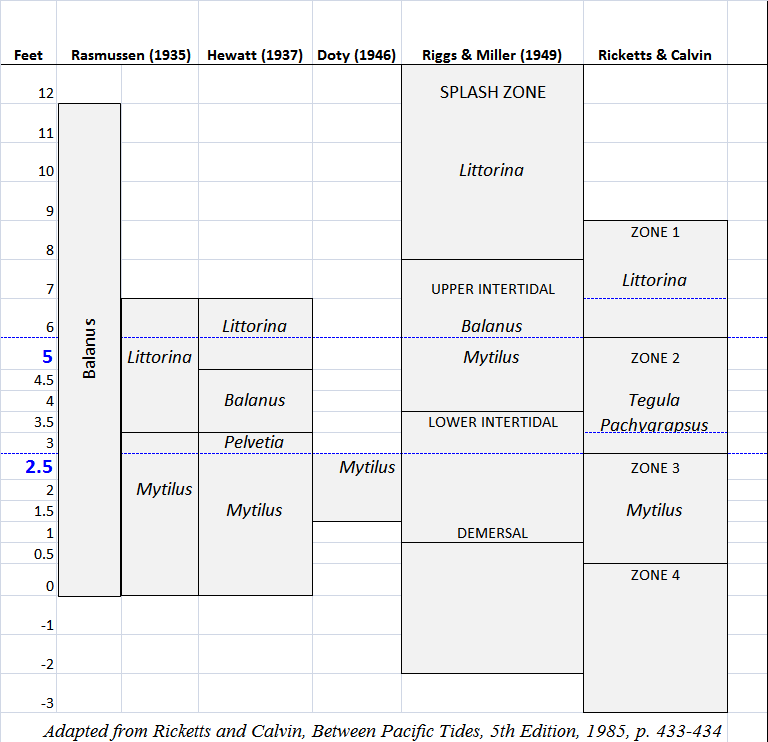 “Zones are displaced upward as one proceeds toward more exposed part of the coast” in a manner like that shown in this chart, where Zone 3 is displaced from a mid-tide region up into a high-tide region (Ricketts and Calvin, p. 9). Of our survey sites, White Rock SMCA in Cambria, and FMR in Moss Beach, were determined to be Open Coast (slight modified at FMR by offshore reefs). Horseshoe Cove at Bodega Bay is Protected Open Coast. In consideration of the foregoing, we feel that our assignment of mussels and goose barnacles to Zone 2 in the intertidal zones of Fitzgerald Marine Reserve and Horseshoe Cove is not unreasonable. Such assignment is more problematic at FMR, where the shallow gradient of the rock shelves there complicate an assessment of zonation, however at both sites the animals seemed much higher than other indicator species for lower zones. A little tide-watching over a few days at the sites might resolve the issue. Determining Relative Abundance. Detecting relative changes in the abundance of intertidal species is one objective of long-term monitoring projects such as PRIM, which follow core procedures that include measurements of key species or species assemblages over time. “Targeted species are monitored within fixed plots annually or semi-annually.” The measurements are percent cover for algae and individual counts for invertebrates (“animals”). Typically, PRIM and MARINe monitor and report these different categories separately. Attempting to report them together for comparison presents an anomaly ̶ percent cover and count per square meter are incompatible metrics. 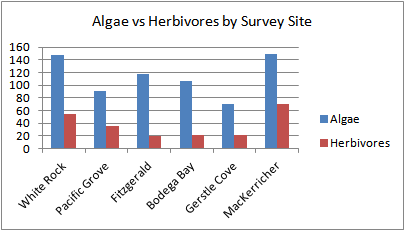 In our surveys, we first attempted to report Relative Abundance of algae and animals by converting percent cover (averaged for the four zones we report) and counts (totaled for four zones) to an estimated point value for the measure of each species to show the presence of one species more or less relative to another. Something similar takes place in PRIM data when “In order to standardize species resolution across all MARINe groups, and over time, some species (typically rare) were lumped for graphical presentation of Long-Term monitoring data” as stated in a PRIM Bolinas Point Long-Term trends webpage. Ultimately, however, assigning a point value for relative abundance did not yield meaningful comparisons that provided a useful view of relative abundance of algae and animals. Consequently we changed the charts in each site’s survey report, and the charts in the above Combined Survey Sites section, to report the abundance of algae and plants by percent cover, and animal populations by count per square meter. Using these metrics, while relative abundance of algae and animals cannot compared directly, we can compare algae to algae, and animals to animals, and measure changes over time to show if algae cover has advanced or receded, and if animal populations have increased or decreased, and then say whether there is more or less of one in comparison to another. Species diversity. Understanding of the dynamics of biodiversity in the California coast intertidal is complicated at this time by the presence of star fish wasting syndrome in the Pacific coast population of sea stars, as well as the dearth of detailed information regarding the true scope of the impact of catastrophic events on marine invertebrates of the intertidal communities surveyed. The absence of intertidal urchins may be the result of a die-off of urchins and several other species, including sea stars and abalone, that took place on the Sonoma coast, from south of Bodega Bay north to Anchor Bay, in August of 2011 at the same time as a large red tide algae bloom (DFG Marine Management News, 2011). Perceptible recovery of urchins in this intertidal does not yet appear to have taken place after more than two years. Fitzgerald Marine Reserve. Significant in our site was the rarity of barnacles in any number, sea stars other than a rare bat star, shore crabs, and sea urchins (and owl limpets, unless they were reported the San Mateo County survey [Tenera, 2004] under the Family name Lottidae). Mussels however are present at FMR in large numbers. Anecdotal opinion from casual observations by visitors to FMR suggests that diversity at this location has fallen dramatically over the years since we first surveyed owl limpets here in 2001. Ranger Joel Cervantes related that in just the first six months he had been assigned to FMR many people told him that the seashore has changed a great deal. These observations were also noted in the San Mateo County resource assessment (Tenera, 2004, 3-57). In 2004, the San Mateo County survey (SMCS) found sea stars (Pisaster ochraceus) relatively common between Moss Beach Reef and Pillar Point, counting 144 Pisaster ochraceus on Frenchman’s Reef and noting that only one Pisaster ochraceus had been counted the year before (Tenera, 2004, 3-57). Our survey found no Pisaster ochraceus at all, and saw only two bat stars (Asterina miniata). This fluctuation likely is complicated further by the presence of star fish wasting syndrome in the Pacific coast population of sea stars. The purple sea urchin Strongylocentrotus purpuratus typically ranges from the intertidal to the subtidal, however that species is not listed among the those present in the FMR intertidal in the studies previously cited for either the periods 1994-98 or 2004. Neither were any purple urchins found in the FMR intertidal by this survey. San Mateo County monitored mussel (Mytilus californianus) populations in beds the length of the FMR reserve over a period of ten years from 1994 to 2004 and found no significant change in numbers. Counts were summarized for reporting so they cannot be compared with the counts made by this survey. Large beds of mussels were observed by our survey. In the SMCS PDF, Figures 3-22 and 3-15 show relative populations of several limpets at FMR. In the 1994-98 period, Lottia scabra were found in the largest numbers, with about half as many L. digitalis; L. asmi, L. limatula, and L. pelta occurred infrequently. In 2004, the mean abundance of L. scabra appears to have fallen off substantially, along with that of L. limatula; L. asmi and L. pelta were still rare. These numbers suggest an overall decline in the population of limpets at FMR. In our survey, we sampled quadrats along the rock surface of Zone 2 in the Moss Beach Reef area and only occasionally found Lottia digitalis on bare rock surface not covered with Endocladia or Neorhodomela. We did observe limpets more frequently in other areas, on bare rock surfaces free of algae. In the SMCS PDF, Figures 3-22 and 3-15 showed striped shore crabs Pachygrapsus crassipes were found occasionally in 1994-98, but had negligible presence in 2004. Our survey saw no shore crabs here. We found only one owl limpet, at FMR. Bodega Marine Reserve (BMR). Barnacles and mussels, while uncommon at some other survey sites, were abundant at our survey site. Missing from our BMR survey are sightings of sea stars, in particular Pisaster ochraceus (one bat star, Asterina miniata, was seen), the purple sea urchin Strongylocentrotus purpuratus, and shore crabs such as Pachygrapsus crassipes. No owl limpets were encountered. Gerstle Cove, Salt Point SP. On the rocky shore of Gerstle Cove, Salt Point SP, a population of striped shore crabs Pachygrapsus crassipes, thrived by the hundreds; this was the only site where these shore crabs were seen in any number. Laguna Point At MacKerricher. While our site had an abundance of acorn barnacles on rocks in the upper zone, there was a remarkable absence of sea stars (Pisaster), shore crabs, and urchins. Urchins may still be recovering from the 2011 algal bloom (Rogers-Bennett, 2011), and they may also be subject to extraordinary human predation. Mussels are not present within the Laguna Point inlet, but are abundant in beds outside the inlet. No owl limpets were observed in this MacKerricher survey. In conversation with Pomo Indians who have frequented Laguna Point for many years harvesting abalone, in particular the Pomo elder “Elliot,” the following anecdotes were offered. Elliot had been coming to take his limit of abalone at Laguna Point each year for nine years. Abalone. Each of twenty Pomo Indians gathering abalone that morning take their annual limit of eighteen abalone at Laguna Point, so a ballpark estimate of the annual catch produced here would be 350 to 400 abalone. Algal cover. Nine years ago the area surveyed had rockweed and turfweed much as it does now. Shore crabs. In the past there were many shore crabs in the inlet, but that now there are none. Urchins. In the third week of April this year, 2014, Elliot observed many purple sea urchins at Laguna Point, but that a short time later “a swarm of Asians came in and picked them all up and took them out,” and that now a single urchin could not be found. Impact of Species Loss. Removal experiments would seem to have established the interrelationships of predator and prey in intertidal communities, and how the presence, decline, or absence of one species can cause the population of another species to fluctuate. Moreover, some research on loss of species from an intertidal community proposes that the removal of “more than one species often result in interactive effects, suggesting a high degree of complexity and unpredictability” (Crowe, 2005). One hypothesis advanced is that the interaction is “idiosyncratic,” which is to say it depends on which species is lost and which species feels the impact. An example of the idiosyncratic view would be an algae that grows when limpets are absent, or when mussels are present and prevent limpets from grazing, and that does not grow when limpets are present and unimpeded. In the case of our survey sites, it is possible that as the predators of marine algae, urchins and limpets, have declined from the intertidal community, algae such as Neorhodomela, Endocladia, Mastocarpus, and Petrocelis have had increasing opportunity to grow and thrive. Algal Cover. In our Monterey Bay NMS Survey Report we said that “the consequences for recruitment and settlement of intertidal animals on rock surfaces, and species diversity in general, would seem to be impacted by the quantity of Endocladia [E. muricata, turfweed] covering substrates.” We now revise that to state “quantity of marine algae,” because turfweed was only one of several algae abundant at our survey sites. Substantial surfaces of our survey sites also were occupied by Mastocarpus (M. papillatus, stunted Turkish towel), Petrocelis, (P. middendorffii, tar spot algae), and Neorhodomela (N. larix, black pine rockweed). Rockweed is a perennial that declines in winter and flourishes quickly in spring and summer (Netarts Bay Today, 2013). Once established, dense populations of Neorhodomela larix are able to spread by vegetative propagation from existing algae into large mats covering rock surfaces that persist for long periods and “easily monopolize the rocky surface in a tide pool” (Klinkenberg, 2013). At White Rock SMCA, Cambria CA, the small plot we surveyed was dominated in the middle and lower intertidal by turfweed, Macrocarpus, Petrocelis and Tegula. The rocks at our Monterey Bay NMS, Pacific Grove CA survey site were almost completely covered with turfweed in which plentiful Mastocarpus occurred, with occasional encrustations of Petrocelis, and some sea lettuce (Ulva). An occasional turban snail (Tegula funebralis) or limpet (Lottia) could be found underneath the Endocladia, however turfweed seems to have taken possession of most of the rock surface. Moss Beach Reef at Fitzgerald Marine Reserve (FMR) is covered almost entirely by marine algae, a large bed of rockweed taking up over one half of the area. As noted above in the Fitzgerald PRIM 2002-2006 survey, rockweed increased from 4% cover to nearly 6% between 2002 and 2006, one percent per year. In the eight years since, it might have been expected to have increased to 14%; allowing for exponential growth, it is perhaps not surprising that rockweed cover at Fitzgerald has increased to 50%. On the east and west sides of the bed, rockweed transitions abruptly to turfweed mixed with Mastocarpus along the near straight line of Transect A (see FMR Field Data Sheet photos). Similar abundance of these algae has been reported in resource assessments at FMR in 1994-98 and 2004 (Tenera, 2004), indicating that algal cover has been consistently dense at this location for over fifteen years at least. At Horseshoe Cove, Bodega Bay CA, turfweed was abundant on nearly all the rock surface of the survey area that was not settled by mussels. Zone 1 largely was unpopulated bare granitic rock, but the upper portion of Zone 2 was exposed granite covered by turfweed and Ulva, and the lower rock surfaces in Zone 2 and Zone 3 were covered by abundant turfweed, Ulva, and Egregia. A large colony of mussels occurs together with the turfweed. As at Fitzgerald, turfweed was not the predominant rockweed at our survey site in Gerstle Cove, Salt Point SP, where it was challenged by two prolific rockweeds we have not yet been able to identify (see below). These two unidentified rockweeds were about 40 percent of algal cover in Zone 2, and 20 percent of algal cover in Zone 3, while turfweed was never more than 5 percent of the algal cover in either zone. Marine algae covered 30 percent and more of the available rock surface at our site at Laguna Point, MacKerricher SP, the predominant representatives being turfweed, black pine rockweed, and Mastocarpus. Our counts of species by relative zonal occurrence (in the survey report) show that marine herbivores ̶ limpets, littorines, and chitons ̶ were low in proportion to the amount of turfweed and appear insufficient to impact colonization of open space by turfweed, rockweed, Mastocaspus, Petrocelis and other algae. Early in our survey we wondered if recruitment and settlement of other biota might be impacted by the quantity of marine algae we encountered. Our experience since prompted the article Weeds in the Intertidal Garden at this project’s website, in which we state the view that “far from impeding settlement in the littoral, turfweed and rockweed have been found to provide habitat for many neighbors that shelter under the algae’s canopy to avoid the stress of wave action, desiccation, and being eaten by limpets, including even mussel larvae.” Closer examination might have revealed more such neighbors at our survey sites. Petrocelis. Most descriptions of this crustose tetrasporophyte phase of Mastocarpus refer to it as “spotting” rock surfaces in small encrustations and, while it often is encountered that way, Petrocelis also often can cover large areas of rock surface and effectively prevent settlement of other biota. Forty years ago, Mastocarpus and Petrocelis were thought to be separate genera; later experiments culturing Mastocarpus showed it and Petrocelis are different phases of a single taxon. 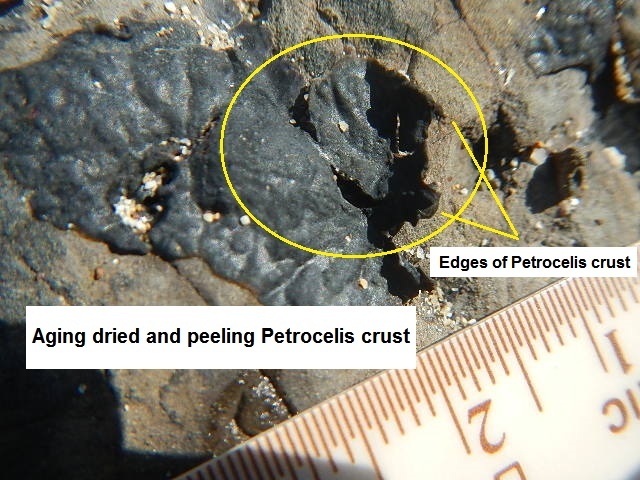 Aging of the crust is still under examination, however Petrocelis is believed to live at least seventy years; the dried out and peeling crust our survey found at Fitzgerald may have been a final stage in the Petrocelis cycle. Petrocelis occupies perhaps half the available rock surface in Zone 3 of our survey site at White Rock SMCA, Cambria CA and, as no other animals or plants were observed growing atop Petrocelis, may be a contributing factor to the reduced diversity of intertidal life at this location. Petrocelis was not so evident at our Monterey Bay NMS, Pacific Grove CA and Fitzgerald Marine Reserve survey sites, where it encrusts only about 10% of rock surfaces. 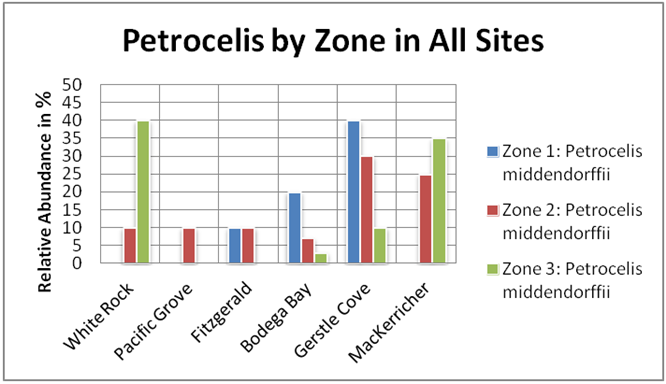 Neither was Petrocelis so prominent at Horseshoe Cove, Bodega Bay CA, where it occupied perhaps 20% of the higher zone of our survey site and only 10% to 15% of the lower zone substrates. At Gerstle Cove, Salt Point SP, Petrocelis is quite prevalent in Zone 1 and Zone 2, occupying up to 40 percent of rock surfaces; A. elegantissima and calcified encrusting coralline algae, as well as Mazaella splendens, Ulva, and limpets were observed on top of the Petrocelis. As much as 35% of middle zone rock surfaces were encrusted at our site at Laguna Point, MacKerricher SP, with only a few invertebrates and other algae found on top of the Petrocelis. Tegula and Mastocarpus. We commonly observed Tegula in the vicinity of Mastocarpus, and other algae, typically in crevices below the algae at low tide. The presence of large populations of Tegula may be related to the abundance of Macrocarpus, on which Tegula is known to feed (Zavela and Williams), as well as the absence of Tegula predators such as shore crabs and sea stars. Our surveys might have observed Tegula moving up into Mastocarpus to feed had we remained on site during high tides. Tegula were distributed through three lower zones. At White Rock and Pacific Grove, Tegula were found very low, below beds of Mastocarpus, at the same level as Phyllospadix, an index for Zone 4. Endocladia. The consequences for recruitment and settlement of intertidal animals on rock surfaces, and species diversity in general, would seem to be impacted by the quantity of Endocladia covering substrates. While at most of our survey sites we saw few instances of other species together with Endocladia ̶ an occasional Tegula, limpet, or Ulva was all, and Petrocelis was not seen together with Endocladia ̶ browsing online literature did not locate any studies indicating that Endocladia prevents settlement of sessile animals, and we found more suggestions that the larvae of Mytilus often settle in Endocladia (O’Clair and Lindstrom, 2000). That relationship was confirmed when we found Mytilus closely associated with Endocladia at Horseshoe Cove. Some of our stats show a decided imbalance at most sites between populations of E. muricata and marine herbivores. When grazers are absent from an E. muricata assemblage, and other conditions permit, the algae will colonize surrounding open space, and when grazers are present, algal recruitment of open space declines (Walder 1999). So, it would appear that one common constraint on E. muricata growth, marine herbivores, is not present at some locations, and that the number of grazing invertebrates there is not sufficient to interfere substantially with algal recruitment. A deficit such as this would be abetted when an abundance of Endocladia prevents recruitment and settlement of herbivorous gastropods by reducing the open space needed for grazing. Unidentified brown rockweeds. At Gerstle Cove we find that E. muricata is not always the predominant rockweed in the California intertidal zone, being challenged there by two prolific rockweeds we have not yet been able to identify, and at Fitzgerald Marine Reserve by black pine rockweed (Neorhodomela larix). These two unidentified rockweeds, one of which seems not unlike Neorhodomela oregona (see example at Seaweeds of Alaska), are together about 80 percent of algal cover in Zone 2 of our survey site at Gerstle Cove, and 40 percent of algal cover in Zone 3, while E. muricata is never more than 5 percent of the algal cover in either zone. 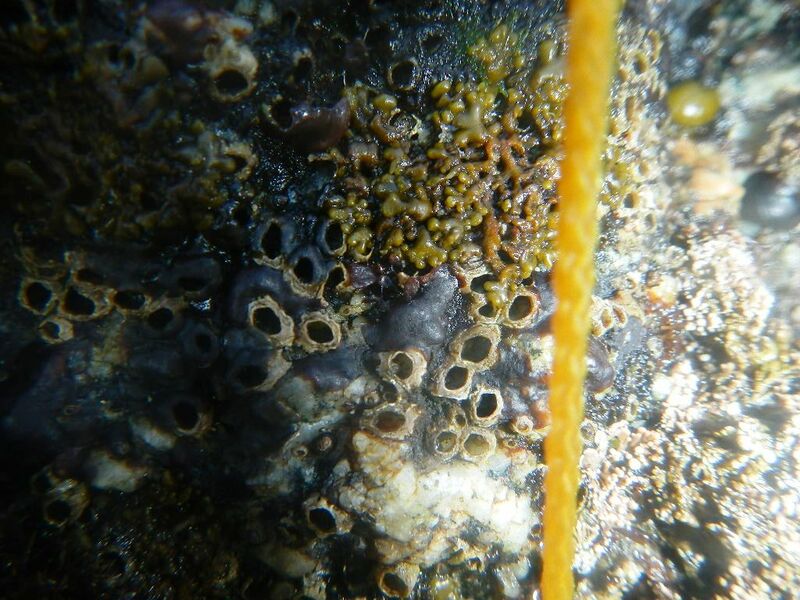 A 2010 UCSC Survey found Odonthalia flocosa, Sea Brush, to be the most abundant algae at their survey site. We researched O. flucosa hoping it might be one of our two unidentified rockweeds, and distant photos of mats of O. flucosa do appear similar (as do other rockweeds from a distance), however in close-up the two algae do not look alike. 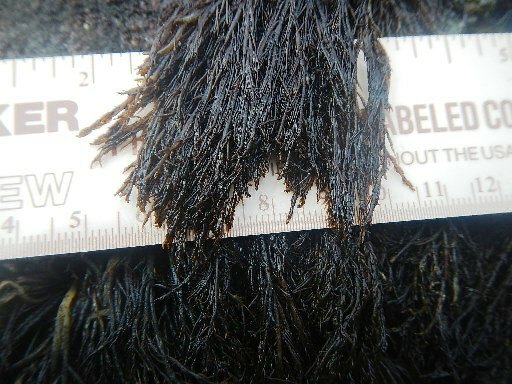 The stringy quality of the one of our unidentified rockweeds seems quite different from any other algae indexed online. Click to enlarge. O. flucosa photo, at right, by Wendy Feltham, iNaturalist. This called for closer attention to the splash zone barnacles photographed for our surveys. Unfortunately, in our first four surveys barnacles were not examined closely enough to determine species (just assumed to be B. glandula). Pearlstein (2004) describes C. fissus as “smaller, [up to] 8 mm in diameter, and has a smooth, oval operculum, whereas B. glandula is larger and has deeply ridged plates on the operculum,” however our photographs do not have sufficient resolution to show an operculum clearly. Neither do the barnacles at this location have the dramatic variance in size shown in photographs of C. fissus together with B. glandula; at the Pacific Rocky Intertidal website for Chthamalus/Balanus; those in our survey all appear the same size, about one to three millimeters. Later we searched out an article at Thomas Carefoot’s website A Snail’s Odyssey that shows the convoluted fissure demarking the north and south of the terga and scuta of the plates of the B. glandula operculum, and its diamond-shaped opening. 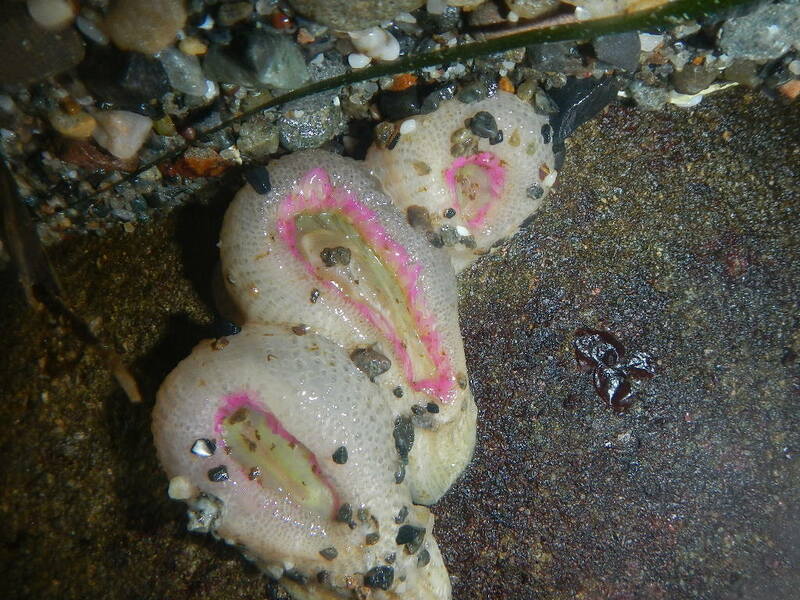 An article on the same subject at a UCSC Pacific Rocky Intertidal website shows the oval-shaped opening of C. dalli/fissus and confirms the absence of fissures in its operculum. 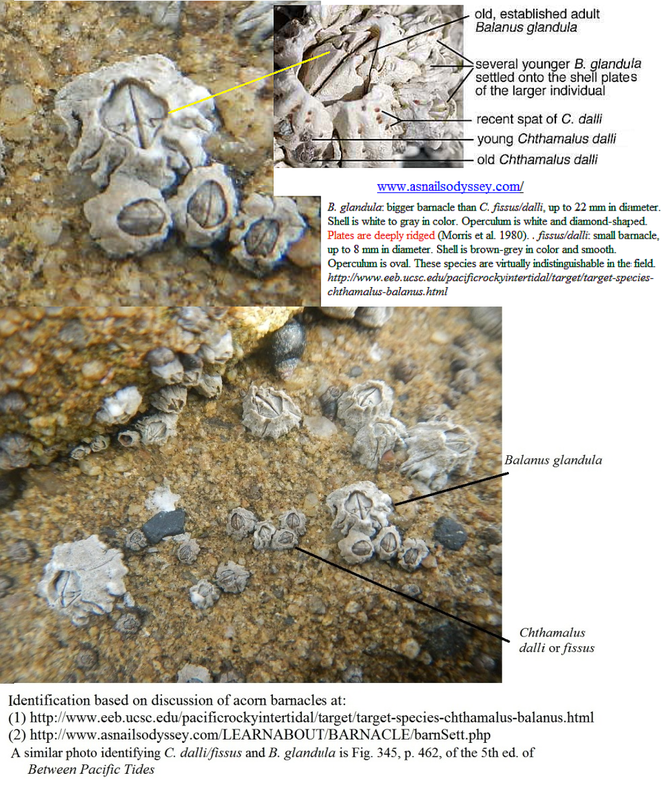 In the photographs we took of barnacles at Gerstle Cove these differences are quite clear and B. glandula and C. dalli/fissus can easily be distinguished. Barnacles. 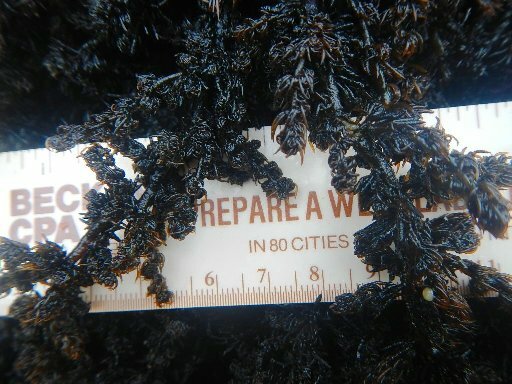 Barnacles observed at our Bodega Marine Reserve site appeared to evidence a higher mortality than at other survey sites, judging from the number of empty tests encountered. The survey neglected at the time of observation to distinguish between barnacles with intact opercula, and those with empty tests, so data from this survey cannot be used to determine mortality statistics for the population surveyed. Three situations were observed: (1) apparent victims of Nucella predation, (2) barnacles enveloped by Petrocelis, and (3) barnacles enveloped by calcified encrusting coralline algae. Nucella ostrina occur in moderate numbers in the survey area, often among barnacles on bare rock faces. There are mussels about 30 meters distant from the transects of this survey, probably too far away for these Nucella, so it seems likely these are preying on barnacles here. Several barnacle tests in the photo have dark openings, which probably indicates there no longer is a living animal within. The Petrocelis in this photo appears to be enveloping the barnacles – the barnacles are not on top of the Petrocelis, but rather the algae has moved up the sides of the barnacles, over the edge of the tests, and down into the tests. In many barnacles, no terga and scuta can be seen, and the test appears empty. 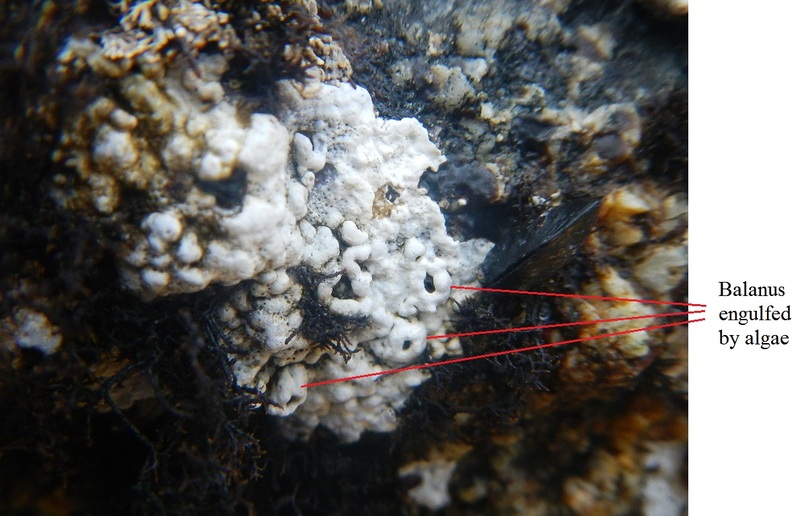 Terga and scuta can be seen inside a few nearby barnacles not touched by Petrocelis. In this photo the barnacles appear to have been engulfed by calcified encrusting coralline algae. It is not possible to tell if the algae is responsible for barnacle death and, considering the presence of Nucella, is seems more likely the barnacles were already dead when enveloped by the algae. An interesting question is whether living barnacles have any defense against being enveloped by algae, or whether they need any. Nucella. N. Scott Rugh (Differences in Shell Morphology…, 1997) in correspondence informed the author that “The striped species of dogwinkle was formerly known as Nucella emarginata. Now it is known that this is two species, with a northern species, Nucella ostrina, and the name N. emarginata is used for the southern species. The two overlap somewhere around central California, around the northern limit of N. emarginata and the southern limit of N. ostrina.” Ostrina was the identification chosen for the specimens found by this survey, based on the shell morphology and range map for Nucella ostrina shown at Thomas Carefoot’s website A Snail’s Odyssey. “Albino” Anemones. Most references list white as a not uncommon color for A. elegantissima. Unique specimens of anemone were found on the underside a rock ledge in Gerstle Cove Zone 3. They were out of the water, with mantles closed and tentacles drawn inside, and were white in color with a pink ring around the disk at the base of their tentacles. Above, on the face of the same rock, there was a colony (about 10 per square meter) of Anthopleura elegantissima with individuals of about the same size and shape, and otherwise similar to those under the ledge except that those outside were all olive green in color. We expect those under the ledge also are A. elegantissima and live where the photosynthetic symbionts in the their tissues do not have the direct sunlight needed to produce the green pigment that gives color to the epidermis of anemones living in sunlight (Ricketts and Calvin, 1985, p. 89). While white is not an uncommon color for A. elegantissima, individuals with pink tentacles also are not rare. In this case, we might say we encountered examples of “albino” anemones. Purple shore crabs. 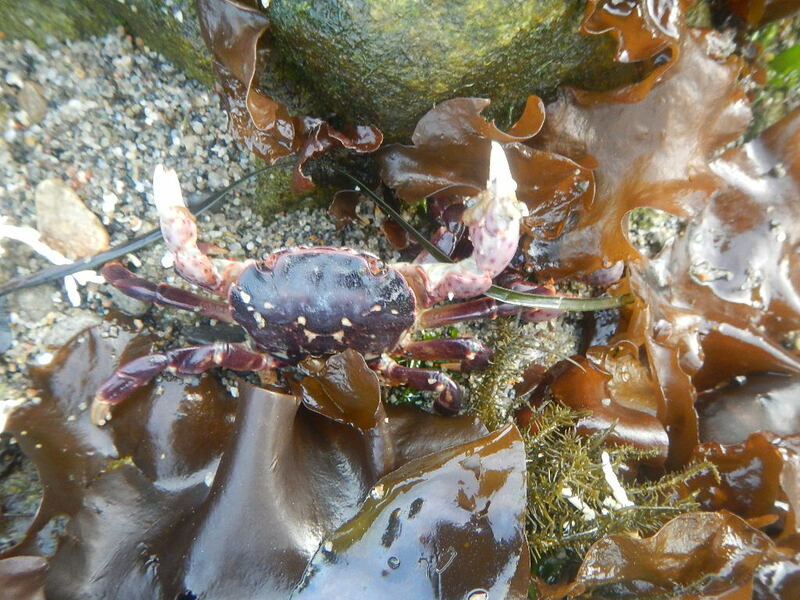 Ricketts said that purple shore crabs (Hemigrapsus nudus) live in the middle intertidal (Ricketts and Calvin, 1985, p. 58) and that the striped shore crab (Pachygrapsus crassipes) is found in the high intertidal (p. 42). So we checked again our photo of the representative shore crab found in the high intertidal at Gerstle Cove and verified that the crab in our photo does not have the striped carapace of P. crassipes, and does have the speckled chelae of H. nudus. Why H. nudus would extend its range upward to live in dry round boulders instead of among the succulent algae of the lower intertidal we will not hazard a guess; why, for that matter, are there hundreds of such crabs gathered together in the tiny high intertidal amphitheater of Gerstle Cove when we have not seen enough to count on one hand at our other five survey sites this Spring? 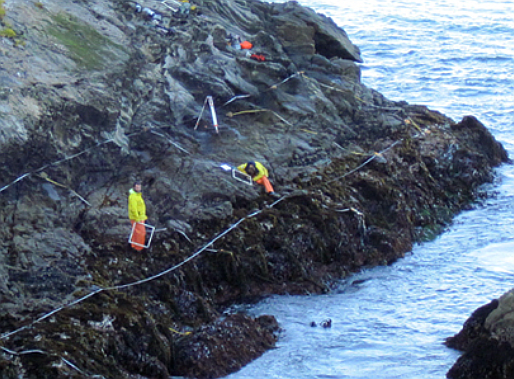 The 2010 UCSC Survey found an average of 0.25 H. nudus per square meter; this difference from our survey might be expected if their survey site was on the south point of the entrance to the cove rather than at the east end of the cove. The baseline offered for the owl limpet (Lottia gigantea) population at Fitzgerald Marine Reserve (FMR) is Levine (2004) in which 140 owl limpets were counted, with densities in the Moss Beach Reef area averaging “almost one owl limpet per square meter.” The San Mateo County survey of FMR (Tenera, 2004) stated that owl limpets “were in highest abundance and were larger in size on Moss Beach Reef,” and this in spite of high visitor use, perhaps because of close surveillance by FMR staff and volunteers. 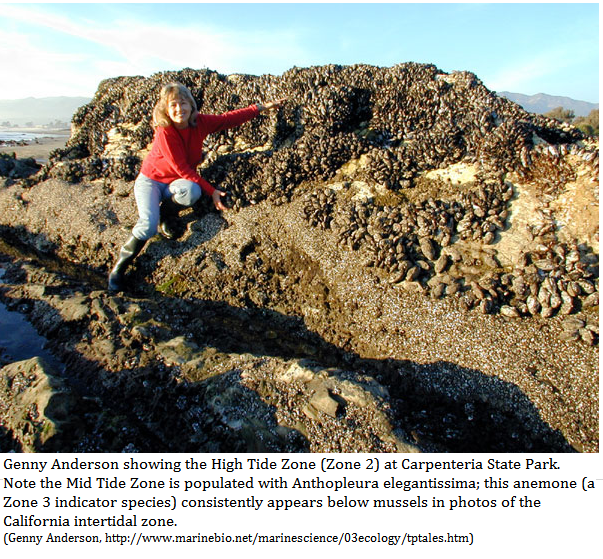 In her article “LiMPETS: Long-term Monitoring Yields More than Data” (Between the Tides, September 2012), Amy Dean reported that the FMR owl limpet population was steady between 2006 and 2011, but that there was a 30 percent decline in population for 2012. Our study found one owl limpet in the FMR intertidal, at the edge of a mussel bed. In 2001, when we conducted a prior study of owl limpets at FMR, there was much greater abundance in the same survey area, although exact counts were not made then. 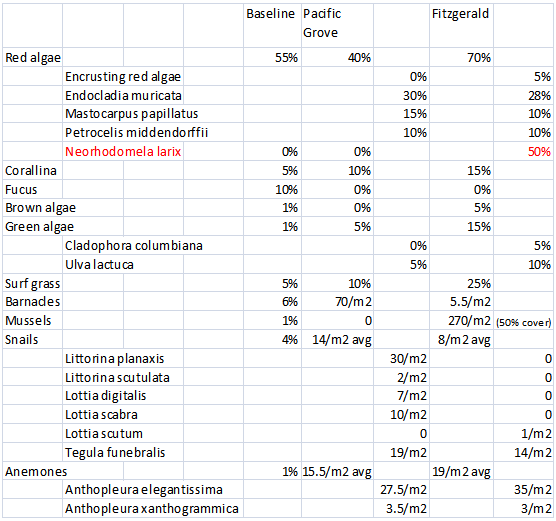 Our results indicate a drastic decline of Lottia gigantea in the Moss Beach Reef intertidal of FMR. Conclusions. Some excerpts from our post Weeds in the Intertidal Garden, which presents nascent conclusions about a variety of native marine algae common in the California intertidal zone, primarily turfweed (Endocladia), Turkish towel (Mastocarpus), tar spot algae (Petrocelis), and rockweed (Neorhodomela), are extracted here. Roll call. We began our surveys this summer by noting the paucity at one or another survey site of several species of animals, and the abundance of several species of marine algae. This apparent lack of faunal biodiversity at our survey sites seemed to be more than just coincidence, when so many keystone species could not be found over a range of almost 400 miles of coastline. Shore crabs in any number were found at only one of six sites. Mussel beds were found at only two sites, one exposed to the open ocean, and the other in a protected cove; at three sites beds of mussels were seen outside the boundaries of the surveys. 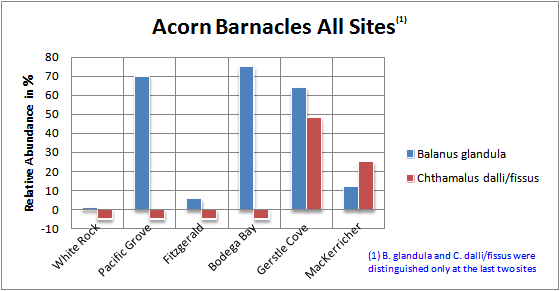 Acorn barnacles were uncommon at two sites in communities where they are regarded as the dominant species. Periwinkles and limpets were never numerous. Only one specimen of an owl limpet was encountered along the entire length of coastline we surveyed. Ochre sea stars and purple urchins were not found at all, but that may be explained by losses to sea star wasting disease, and the 2011 Sonoma Coast algal bloom. Turfweed, rockweed (Neorhodomela), Turkish towel, and tar spot algae covered much of the upper intertidal zones in dense canopies. Marine algae. These aggressive rockweeds and turfweeds arrogate broad swaths of rock surface, apparently preventing other species from settling in the space they occupy, and often becoming the predominant species in an intertidal community. We have wondered how long the intertidal zone has been overrun by these marine algae, how settlement could be accomplished by animals when so much space is taken by “weeds,” and whether the prevalence of marine algae has caused a decline in the diversity of fauna, or the decline in fauna has made possible the ascendance of marine algae. Marine algae have been abundant in the California intertidal zone for a long time, as noted in many studies of individual alga species, and as is graphically shown by photographs from the 3rd edition of Between Pacific Tides in our post Weeds in the Intertidal Garden. Competition. Regarding the question, “How can settlement by animals take place when so much space is taken by ‘weeds,’ ” it is known that turfweed (E. muricata ) competes for space with barnacles (Forde and Raimondi, 2003) and with mussels and rockweed (N. larix; Friday Harbor, 2014). Expanding mussel patches may displace Endocladia (UCSC, 2012, Endocladia), but when mussels are removed from a site by predation or environmental disturbances, turfweed will move into the empty space and start new growth; turfweed will even grow on top of mussel shells (Friday Harbor, 2014). Marine herbivores such as limpets compete with algae by grazing on spores and other recruits of algae and invertebrates that attach to open rock surfaces, maintaining open space as meadow for grazing (Walder, 1999); owl limpets in particular are reported to be very aggressive in clearing open space (Ricketts and Calvin, 1985). On one hand, the activity of these herbivores prevents algae from colonizing, and checks the expansion of turfweed, but at the same time the same activity prevents establishment of other algal species that may compete for space with turfweed. When grazers are not present in an Endocladia assemblage, algae spreads and open space declines (Walder, 1999). The magnitude of E. muricata growth does seem to imply a decrease in populations of grazing herbivores, those that consume or remove attached spores, such as limpet, littorine, and chiton, or those that consume the plant itself, like turban snails and striped shore crabs. Suggested also is ineffective competition by other algae, such as Mastocarpus. Growth of turfweed may point to the relative absence of herbivorous gastropods in numbers sufficient to significantly retard the spread of algae. At the same time, abundance of turfweed may prevent recruitment and settlement of herbivorous gastropods. Facilitation. Far from impeding settlement in the littoral, turfweed and rockweed have been found to provide habitat and shelter under their canopy, where many neighbors are able to avoid the stress of wave action, desiccation, and being eaten by limpets. Amphipods, Petrocelis, M. papillatus, and Sylvetia have been found together with turfweed, Mytilus larvae often settle in turfweed (O’Clair and Lindstrom, 2000), and one researcher (Glynn, 1965) has been cited as reporting between 60 and 90 species sheltering in E. muricata in Monterey Bay (Friday Harbor, 2014; UCSC, 2012, Endocladia). So while marine algae may compete with species for space, algae also facilitate them by offering refuge from physical stress, predation, competition, and improve the availability of resources. Facilitation, however, as a principle in the ecology of intertidal communities is only one of several conditions that might determine how a community comes together, prevails, and persists over time; variations in physical environment and seasonal changes, among others, create a changing “mosaic” of conditions that determine the character of each community (Forde and Raimondi, 2003; Foster et al, 2003). When recruitment and settlement of marine invertebrates is so completely dependent on the conditions of ocean water and the drift of currents, how can there be any wonder that one place has barnacles and limpets, but no mussels or shore crabs, and further up the coast another place has shore crabs by the thousands in one tiny cove, and shoals of mussels along open coast. Terra firma. How different is the case for biodiversity on land? We have been watching a High Sierra meadow in Quincy CA for two weeks now, much longer than any of these surveys, and we have seen many critters, on different days mind you. Deer on Monday, foxes on Wednesdays (washdays), Canada geese and robins nearly every day, and smelled skunks prowling some nights. Tuesdays and Thursdays when we drop by the meadow is usually empty ̶ there is not nearly the vibrancy here as there is at the seashore. We have not seen rabbits, ravens, or Steller’s jays (which jays, by the way, were our companions at Timber Cove CA, elevation 100 feet). There are any number of good reasons why there are no cottontails here, but at present no way of knowing why. We do know why there are no bison, or mammoths. Down the road a ways, in Portola, there may be rabbits, Steller’s jays, and elk, and there also would be reasons for their presence there and not in Quincy (especially on Wednesdays). Snapshots. One other fact stands out ̶ each of our surveys was a static view, one look at a location over a matter of hours, a snapshot. The intertidal zone at any one location, as well as along the entire coast, is a dynamic macrocosm different from place to place according to a variety of conditions over time. Our reading has made us more aware of how changes in substrates, environmental conditions, seasonal variations, habitat change, human impact, or crucial events like contagion, harmful algal blooms, or global climate change, even El Nino all have an impact on individual intertidal communities. Changing one or more of these variables can result in a different community. Eventually, the fundamental question becomes one of whether the apparent consistent decline in present biodiversity noted in our surveys is a trend or a temporary reversal. Monitoring. In the past, long-term studies of the dynamically changing California intertidal zone were rare because of the cost of funding generations of research scientists. Long-term studies extend well beyond the time required to complete a doctoral dissertation, especially when some species live longer than biologists (Paine et al. 1979). In a study over 60 years, Barry et al. (1995) observed species composition changes at Hopkins Marine Station (HMS) consistent with predictions of change associated with global warming ̶ to complete such a long-term study, the authors relied on the descriptions, photographs, and a transect fastened by brass bolts at HMS, of a study by an earlier biologist (Hewatt, 1934). That kind of time scale is needed to follow sea level rise and fall, tide cycles, flow of offshore currents, slow weathering and cataclysmic geologic disturbances, and catastrophic disease and other events underlying the dynamics of the intertidal zone (MBNMS, 2014). We can record the diversity of populations by date and location, but learning the reasons for the variations in diversity is much more difficult. Some of those reasons can be discovered with long-term detailed monitoring of ocean conditions and population changes at specific locations. California’s 1999 California Marine Life Protection Act mandates the creation of marine reserves and provides for the monitoring of reserve conditions by public agencies and universities. 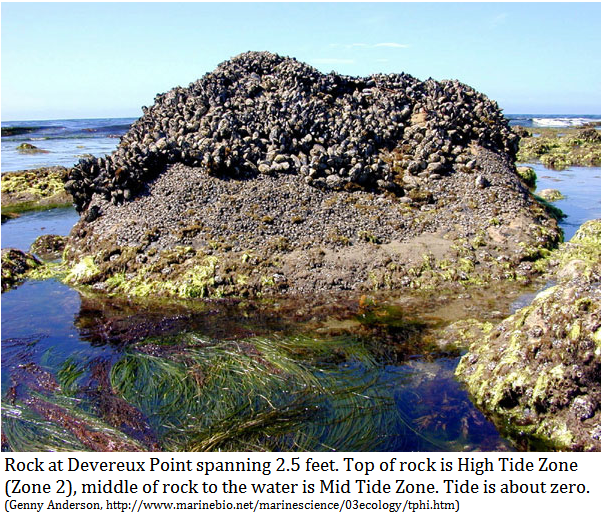 Under the provisions of that law, long-term projects such as UCSC Pacific Rocky Intertidal Monitoring have been established to accumulate historical marine demographics impossible to capture in snapshot surveys by amateur naturalists. The Future. Allowing that populations come and go, what can be said about the future recruitment of species no longer present in the areas surveyed? Will the algae follow a cyclic pattern and retreat from the surveyed areas at some time in the future, and thus allow other species to reestablish themselves, or will marine algae continue to dominate the California intertidal zone? As sea levels continue to rise in coming years, and the intertidal zone moves higher, will new surfaces not yet overgrown by algae become available for recruitment by invertebrates, or will the upper limit for marine algae advance together with the rising sea level. For that matter, the fate of all intertidal zone biota hangs in the balance as zonation changes; as the species of the upper zones are inundated, how many will relocate to higher locations, and how many will be left behind? Why are there hundreds of purple shore crabs in the high intertidal zone of Gerstle Cove and next to none at any of our other sites, and why are there no purple urchins or ochre sea stars at any of the sites we surveyed, and why have so many owl limpets disappeared ̶ these are questions better addressed by historical demographics than by a single season’s surveys. With time and persistent observation we may expect to answer such questions. Some invertebrate communities eventually will reveal their secrets, and others we may never appreciate completely no matter how close our attention over time. Trouble is, we have no way of knowing from which community understanding will come, so we must keep close, patient watch over them all, for a length of time sufficient to solve their mysteries, and try to be there when things change, so that we can better learn how the dynamic and diverse ecological environment of the intertidal zone functions as an integral component of the complex ocean environment crucial to the health of our planet. Barnes, H. and Margaret, Further Observations on Self-Fertilization in Chthamalus Sp., Ecology, Vol. 39, No. 3 (Jul., 1958), p. 550. Barry, J. P., C. H. Baxter, R. D. Sagarin and S. E. Gilman, Climate-Related, Long-Term Faunal Changes in a California Rocky Intertidal Community, Science 3 February 1995: Vol. 267 no. 5198 pp. 672-675. Bell, Katie, Effects of aerial exposure on size of the common barnacle (Semibalanus balanoides), an inhabitant of the intertidal zone in St. Andrews, New Brunswick, Studies by Undergraduate Researchers at Guelph (SURG), Volume 3, Number 2, 2010. California Department of Fish and Wildlife, Introduction to the MLPA website, 2014. Carefoot, Thomas H., A Snail’s Odyssey website, 2014. Carefoot, Thomas H., A Snail’s Odyssey website, “Acorn Barnacle, Chthamalus spp., Research study 1,” 2014. Center for Ocean Solutions, Ocean Acidification webpage, 2014. Coastal Biodiversity Survey, University of California, Santa Cruz, http://cbsurveys.ucsc.edu/index.html. Crowe, Tasman P., “What do species do in intertidal systems?,” in James G. Wilson (ed.) The Intertidal Ecosystem: The Value of Ireland’s Shores, 115–133, Royal Irish Academy, Dublin, 2005. Editors, Physical Gradients, UK Marine SACs Project website, 2001. Fenberg, Phillip B. et al, Genetic diversity and population structure of the size-selectively harvested owl limpet, Lottia gigantea, Marine Ecology 1–10 2010, Blackwell Verlag GmbH, 2010. Fenberg, Phillip B. et al, Range limits and geographic patterns of abundance of the rocky intertidal owl limpet, Lottia gigantea, Journal of Biogeography, Volume 38, Issue 12, pages 2286–2298, December 2011. Forde, Samantha E. and Peter T. Raimondi, An experimental test of the effects of variation in recruitment intensity on intertidal community composition, University of California, Santa Cruz, 2003. Foster, Michael S. et. al., Temporal variation and succession in an algal-dominated high intertidal assemblage, Journal of Experimental Marine Biology and Ecology 289, 2003. Gibbons, Helen and Bob Rosenbauer, Tom Lorenson, and Randy Imai, “Tar Balls from Southern California Seeps Appear on Central California Beaches,”, CDFG Office of Spill Prevention and Response, April 2008. Hewatt, W. G., Ecological Studies on Selected Marine Intertidal Communities of Monterey Bay, Ph. D. dissertation, Biological Sciences, Stanford University, Stanford CA, 1934. Holsinger, Kent, Species Interactions and Biodiversity Conservation, 2005. Klinkenberg, Brian, Neorhodomela larix (Turner) Masuda, E-Flora BC: Electronic Atlas of the Plants of British Columbia [eflora.bc.ca]. Lab for Advanced Spatial Analysis, Department of Geography, University of British Columbia, Vancouver, 2013. Levine, N.E., Size frequency data of Lottia gigantea at the James V. Fitzgerald Marine Reserve, Moss Beach, California. Student paper submitted to the biological sciences department, University of California, Berkeley, 2004. Light, Sol Fetty, The Light and Smith Manual: Intertidal Invertebrates from California to Oregon, 4th ed., University of California Press, 2007. Littler, M. M. and D. S. Littler, 1985, Nondestructive Sampling, Pages 161-175 in M. M. Littler, and D. S. Littler, editors. Handbook of Phycological Methods, Cambridge University Press, Cambridge, UK. MARINe Workshop SWAT Team Guide to common California intertidal invertebrates & algae, 2005. 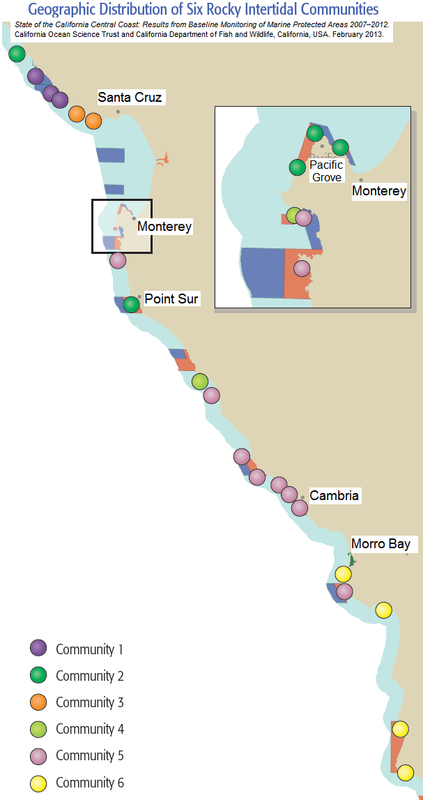 MBNMS (Monterey Bay National Marine Sanctuary) website, Rocky Intertidal Habitats IV, Temporal Changes, 2014. Murray, S.N. 1997. Effectiveness of marine life refuges on southern California shores. California and the World Ocean 1997. 1453-1465. Scott Rugh, Differences in Shell Morphology between the Sibling Species Littorina scutulata and Littorina plena (Gastropoda: Prosobranchia), Department of Biology, San Diego State University, The Veliger, October 1 1997. Netarts BayToday, Neorhodomela larix, Friends of Netarts Bay Watershed, 2013. NOAA Office of Coast Survey, PDF Nautical Charts website, 2014. 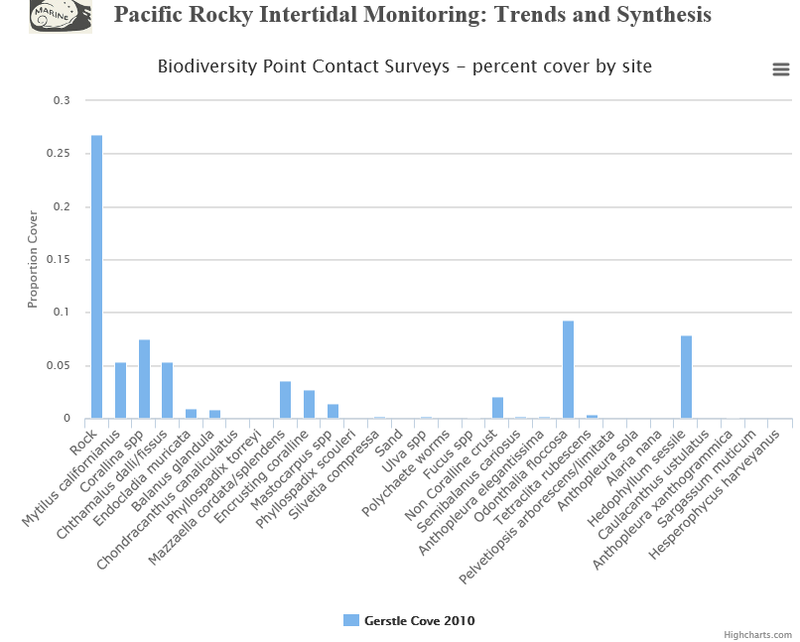 Pacific Rocky Intertidal Monitoring: Trends and Synthesis, “Chthamalus/Balanus (Acorn Barnacles),” University of California at Santa Cruz, Ecology and Evolutionary Biology website, 2014. Paine, Dr. R. T., C. J. Slocum, and D. O. Duggins, Growth and longevity in the crustose red alga Petrocelis middendorffii, Marine Biology, 1979, Volume 51, Issue 2, pp 185-192. Perlstein, Susanna, Balanus glandula, Great Acorn Barnacle (2004). Raimondi, Pete, Rock type affects settlement, recruitment, and zonation of the barnacle Chthamalus anisopoma Pilsbury. Journal of Experimental Marine Biology and Ecology, 123, 253-267, 1988. Rogers-Bennett and Patyten, Abalone and Red Sea Urchins Die During Red Tide in Northern California, DFG Marine Management News, October 2011. Schlocker, Julius, et. al., Geologic And Seismic Investigations Of A Proposed Nuclear Power Plant Site On Bodega Head, Sonoma County, California, United States Department of the Interior Geological Survey, Washington 25, D. C., September 1963, pubs.usgs.gov. Seaweeds of Alaska, Neorhodomela oregona, 2012. Smith, G. W., D. G. Howell, and R. V. Ingersoll. 1979. “Late Cretaceous trench-slope basins of central California,” Geology 7:303-306. California Ocean Science Trust and California Department of Fish and Wildlife, State of the California Central Coast: Results from Baseline Monitoring of Marine Protected Areas 2007–2012, February 2013. Tenera, James V. Fitzgerald Marine Reserve: Resource Assessment, Tenera Environmental, Lafayette, CA , 2004. 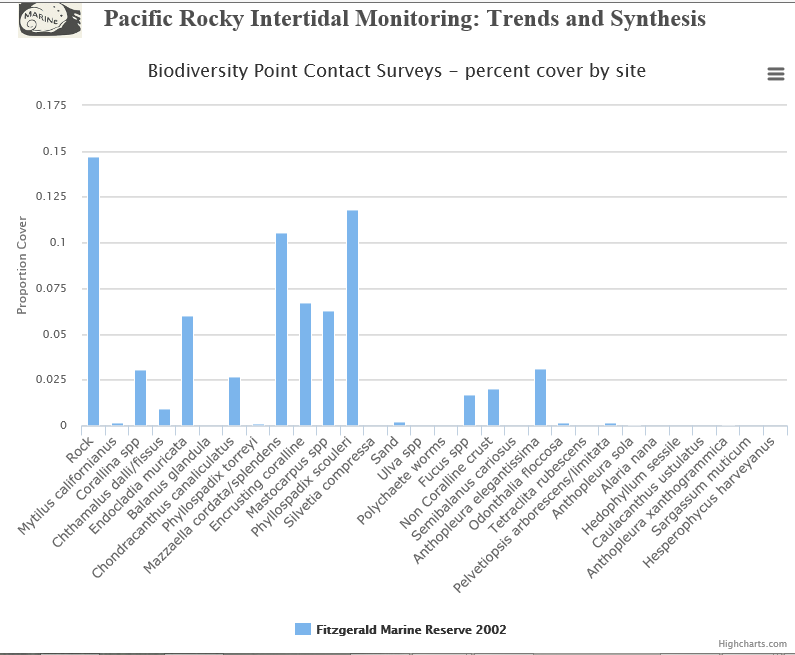 UCSC, Bolinas Point Long-Term trends, Pacific Rocky Intertidal Monitoring: Trends and Synthesis, UCSC website, 2012. 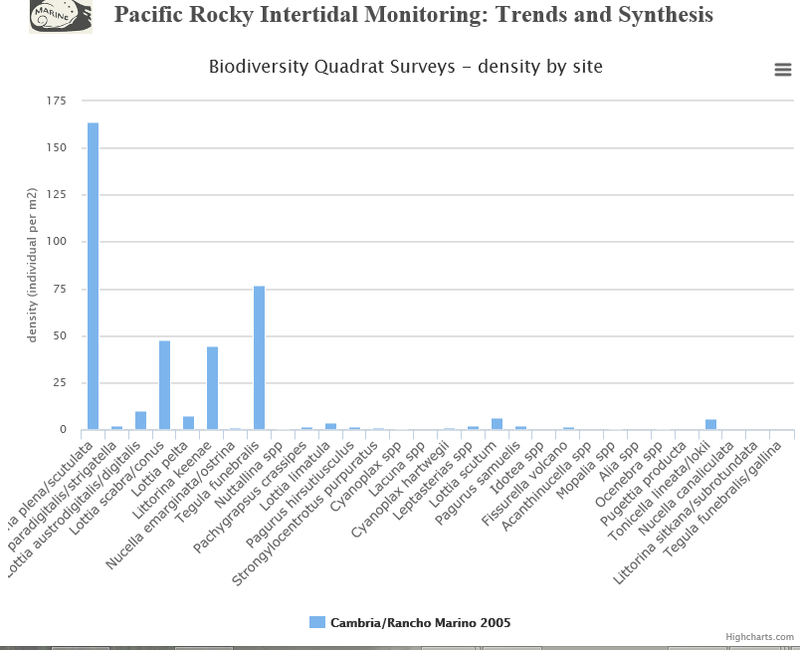 UCSC, Cambria/Rancho Marino Biodiversity Survey Findings, Pacific Rocky Intertidal Monitoring: Trends and Synthesis, UCSC website, 2012. 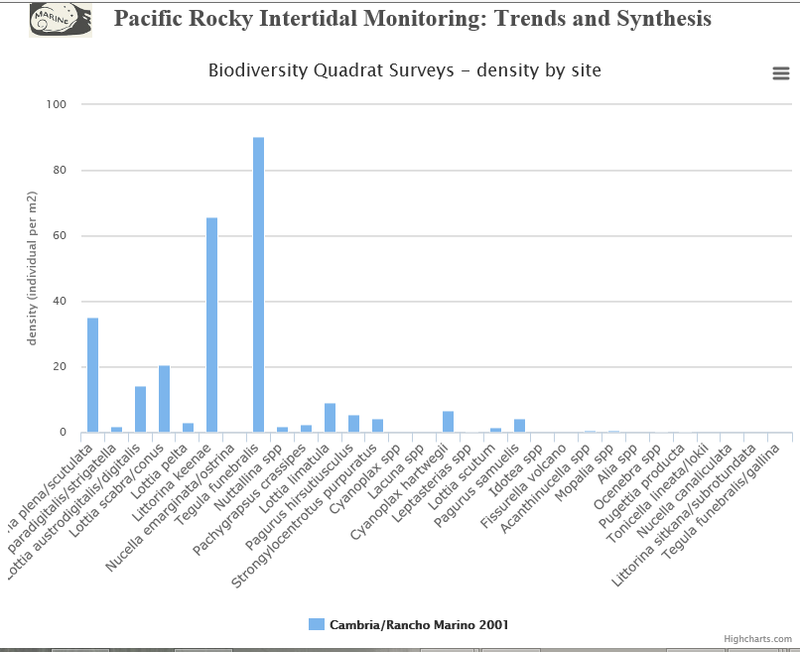 UCSC, Fitzgerald Marine Reserve Biodiversity Survey Findings, Pacific Rocky Intertidal Monitoring: Trends and Synthesis, UCSC website, 2012. 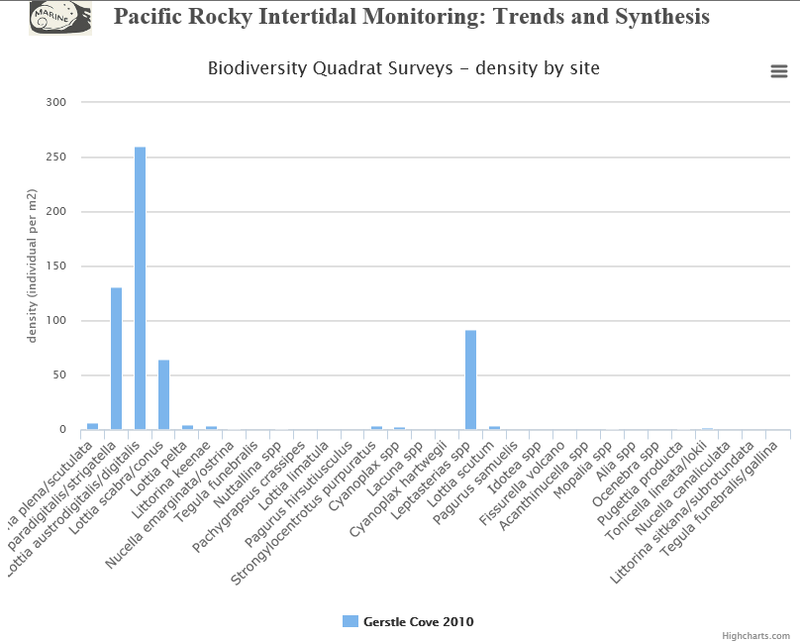 UCSC, Gerstle Cove Biodiversity Survey Findings, Pacific Rocky Intertidal Monitoring: Trends and Synthesis, UCSC website, 2012. 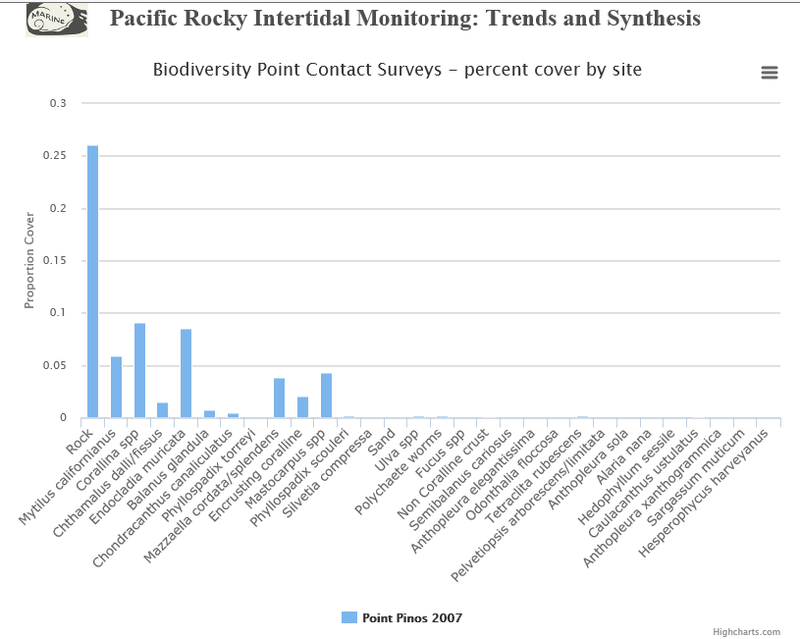 UCSC, Point Piños Biodiversity Survey Findings, Pacific Rocky Intertidal Monitoring: Trends and Synthesis, UCSC website, 2012. UCSC, Lottia gigantea (Owl Limpet), Pacific Rocky Intertidal Monitoring: Trends and Synthesis, UCSC website, 2012. Walder, Ronald K., The persistence of open space in the rocky intertidal Endocladia muricata assemblage, Master’s Thesis, San Francisco State University, 1999. Wahl, Martin, Marine hard bottom communities: Patterns, dynamics, diversity, and change, Ecological Studies Volume 206, Springer, 2009. Zavala, Angelica and Susan L. Williams, “The Heat Is On: Tegula funebralis Grazing Intensity On Mastocarpus papillatus,” Department of Biological Science, Bodega Marine Laboratory, University of California Davis, undated. Commenting on a post at iNaturalist, Meditating on Mussel Beds, https://www.inaturalist.org/posts/4072-meditating-on-mussel-beds, we asked: In what intertidal “zone” would you say are the mussels in photos three and four are located? 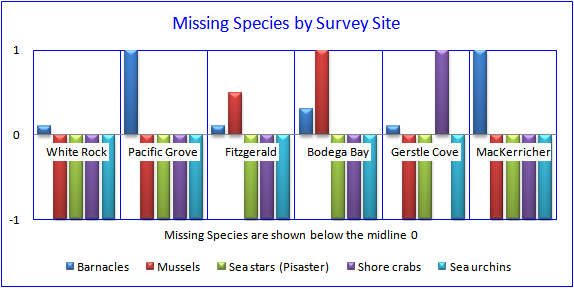 A reviewer of my survey at Fitzgerald, posted at https://intertidalsurvey.wordpress.com/2014/06/08/fitzgerald-marine-reserve-survey-report-april-7-2014/, questioned my observation in April 2014 of the location of mussels in Zone 1, as they are firmly established as an indicator species for Zone 3. Your photos are similar to what I observed and seem to show the mussel beds very high in the intertidal. The author responded: Yes, FMR and Pillar Point are somewhat similar in their topography of being a mostly flat reef with some elevated rocks throughout, and we do usually find mussels on these rocks. I think, though, that I wouldn’t call these rocks “zone 1” in the true sense, because they’re not actually up near the shoreline, where the reef meets the sand/cliffs. We find these rocks with mussels much closer to the “outer edge” of the reef, where they’re obviously getting a lot of wave action and are getting wet early on as the tide comes back in. I think a lot of the traditional illustrations of zonation rely a lot on elevation – that you’re literally going downhill as you move from the shoreline to the subtidal. That’s just not what we see in this section of the coast, and since zonation is truly about emersion/immersion and other stressors (both physical and biological), in some cases you have to rely on the organisms you see to let you know what zone you’re in. So even though these rocks on the reef are high points, because they’re out near the edge of the reef and subject to wave action and early wetting/inundation as the tide comes in, I would still consider the band of mussels an indication that this is somewhere in a zone 3/mid-intertidal area. On some of the truly tall rocks out at the edge of Pillar Point (Sail Rock, for example), I think you could say there are zones 1-4 from the top of the rock down to the base – simply because it’s tall enough that even during high tide, the top is still out of the water, and those organisms are really just getting spray/splash as their primary form of wetness (a characteristic of zone 1/the supralittoral zone). Not so for these shorter rocks in the photos – during high tide they’re definitely all the way submerged, and knowing the mussel beds at FMR, I’d say the same for those rocks – the mussels just couldn’t survive if they were only getting wave spray. Just my thoughts – I’m certainly not an expert in zonation, but I do think it’s important to consider where on the reef these mussel bed rocks are – near the shore vs. closer to the outer edge of the reef.